I could be excused or accused of using the walking half of the outdoor exploits merely as a reconnoissance mission for scoping out potential for future mountain bike rides. 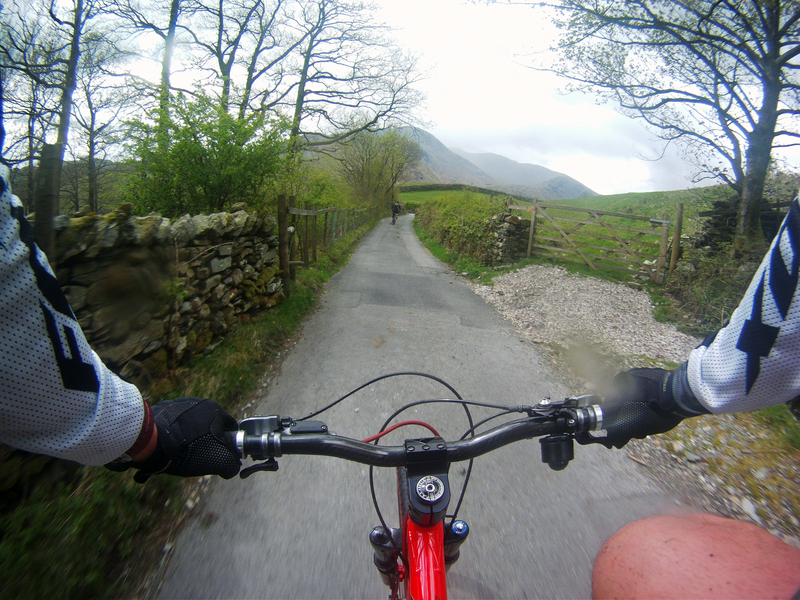 It’s where SMASHing peaks serves the CRASHing around the great riding trails in Cumbria’s Lake District. Ah so what, it makes sense to do so. 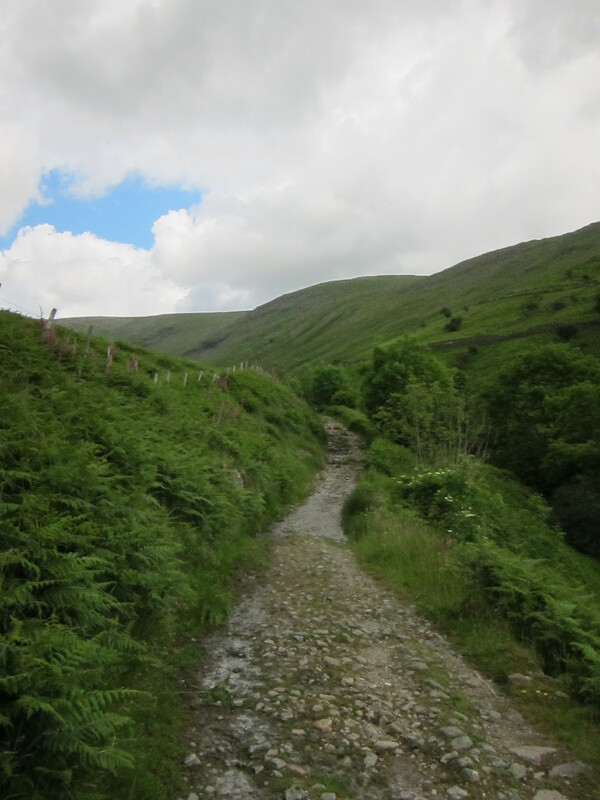 I make no apologies for pretending I’m out walking just for walking sake, why shouldn’t I eye up the quickest line on the trail in case I ever return on two wheels? 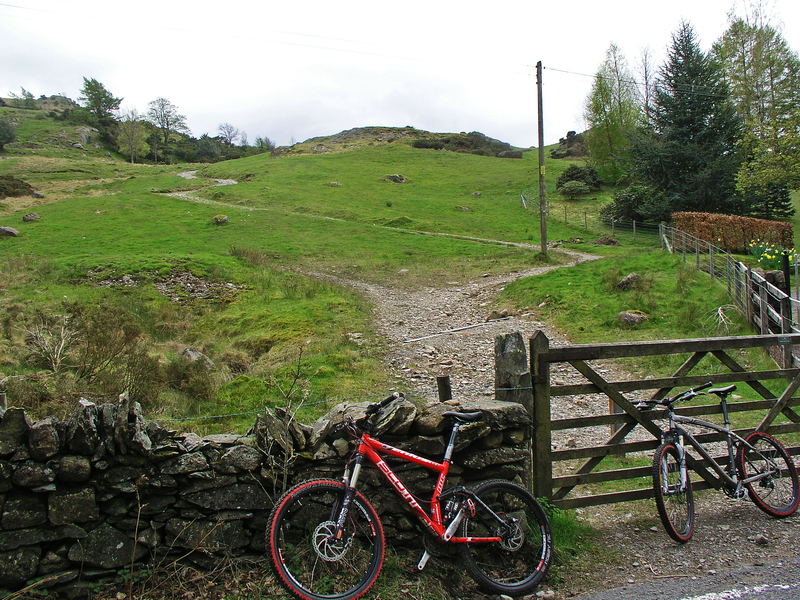 So I got smitten by the very sight of a couple of mountain bikers on the last walk we did onto Loughrigg. 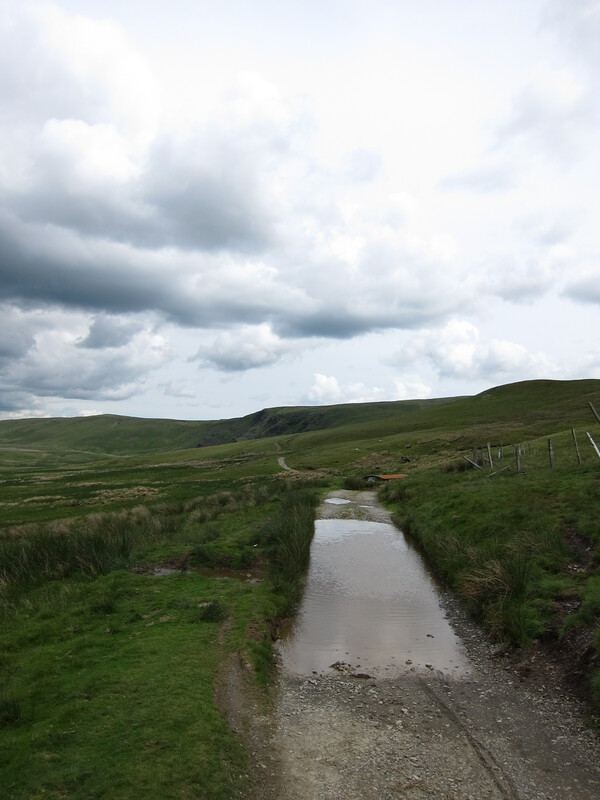 We had originally planned to ride the Horcum gLoop in the North Yorkshire Moors, but after the two days of persistent rain that never fares well for a moors ride, creating a creamy, muddy sludge-fest that presides after heavy rain. 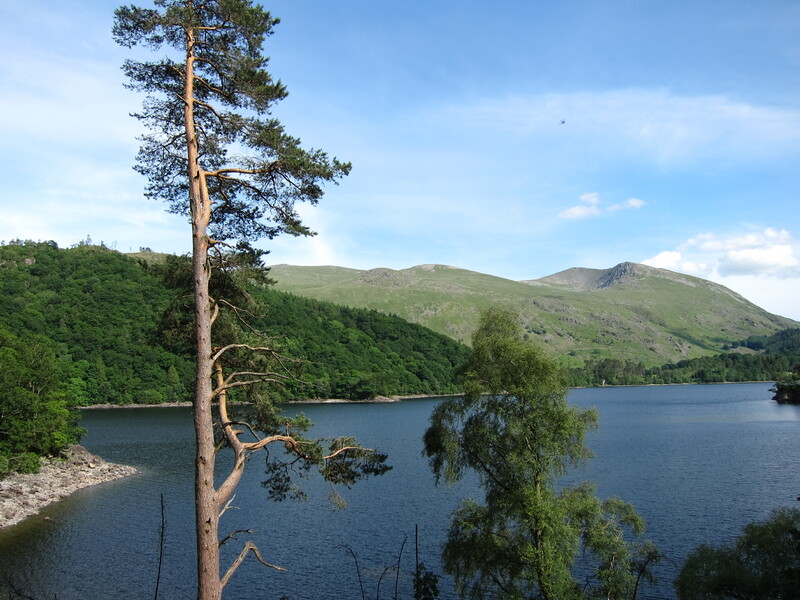 So I decided it was not only wise to head to the slate and stone laden tracks of The Lake District but it would scratch that itch I picked up two weeks prior. The weather was looking like it should continue to stay dry too. While the CRASH half of my circle of pals were largely absent from this ride, Tinkering Mick was bang up for a look out. No doubt a bit disenchanted with the hum drum of the daily commute to work and suffering a bit of tarmac depression. I get it after about 20 yards until I begin searching out rock gardens that are actually rocks in someone’s garden to ride over before I loose my mind. 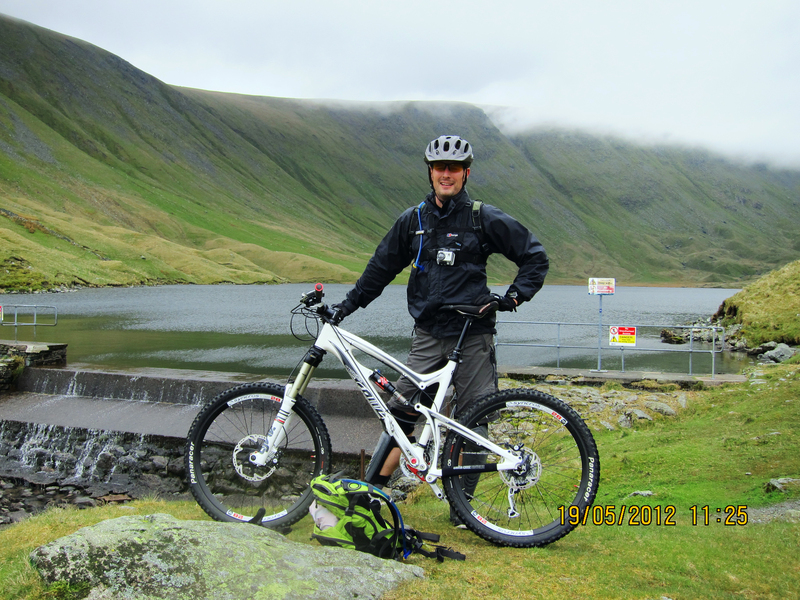 So early start 07:00 or just after to pick up Mick and return once again to Ambleside via A66 and the Kirkstone Pass. Today I started the tinkering. 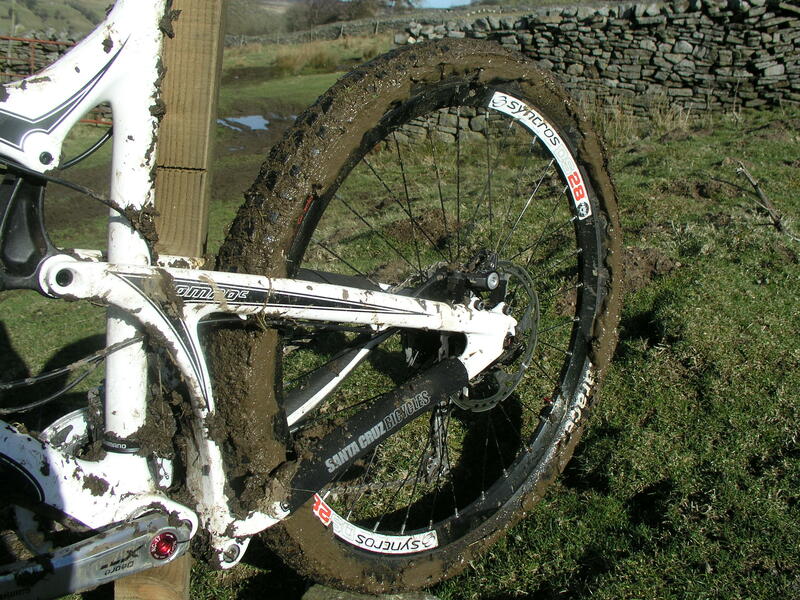 The front tyre had lost air on the journey over. A patch sorted it out and not one of your quick fix types, a proper old school patch from a kit I picked up in Coniston last year during an emergency, one with a crayon, grit paper, french chalk and squirty glue. 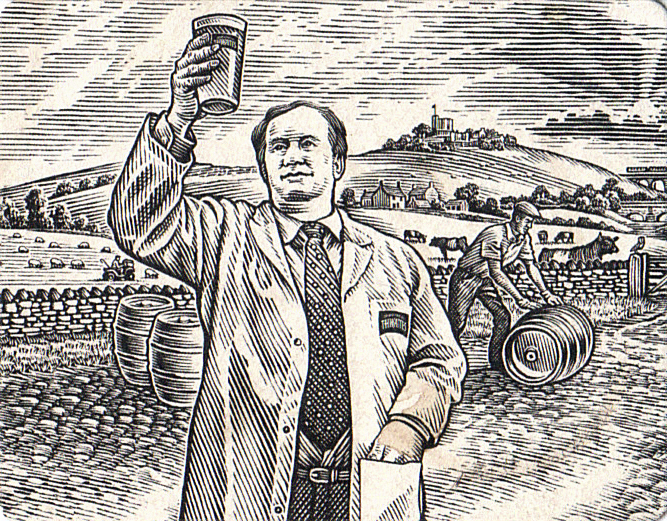 A proper job. 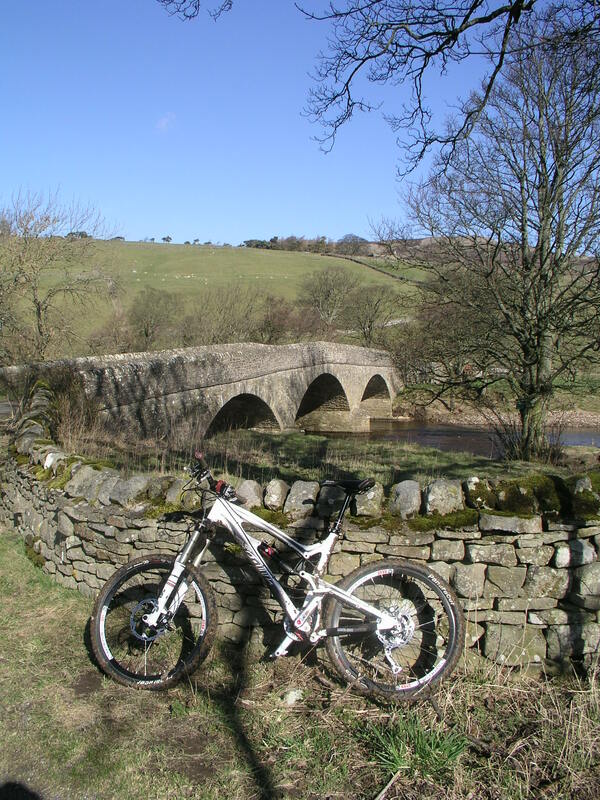 The Genius gets a look out today, while the Nomad is fork free in for a service with Fisher Outdoors since the compression cartridge gave up on The Reeth ride in March. I was concerned for this ride if only for the fact it was going to be tricky for me to navigate. 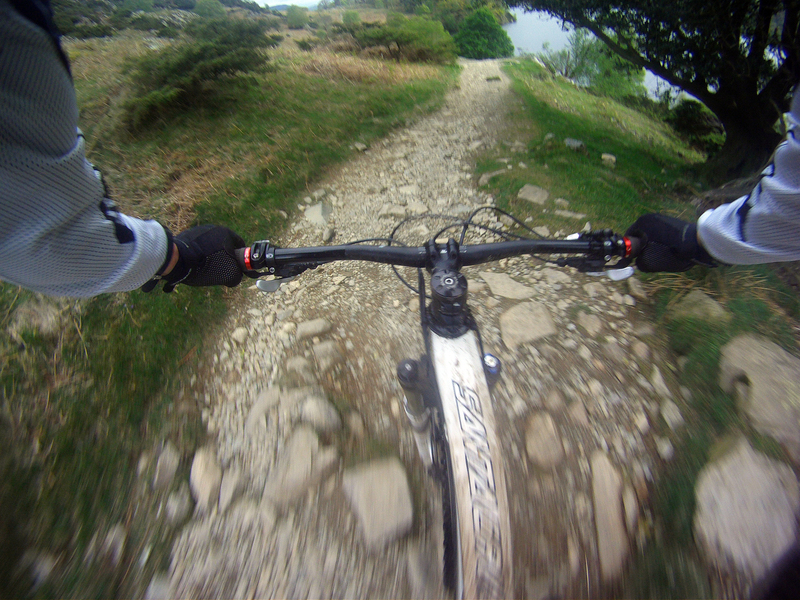 I’m still no good at sticking to the intended route, especially on a bike. The map OL7 for this ride got running repairs last night and is beginning to take on the form of a laminated map due to the amount of sellotape applied to its fraying creases. 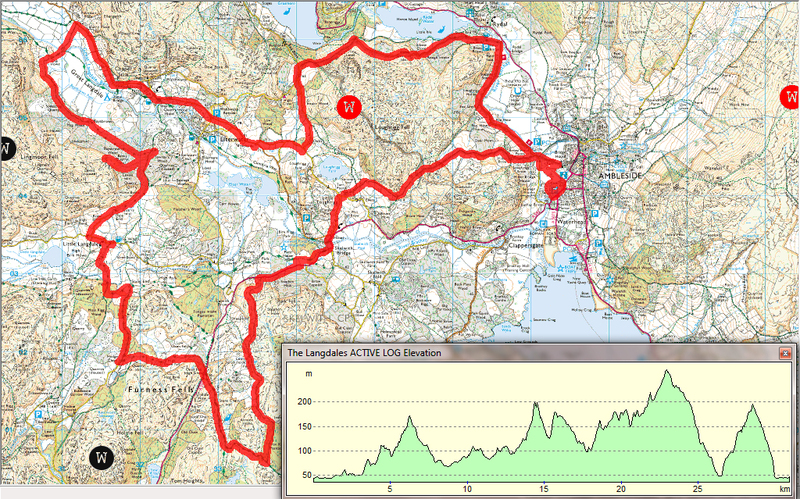 I’d marked out a rather confusing looking route in an attempt to pull the best trails together in one closed loop. I could think of worse places to get lost. I had enough Soreen to feed and small army, some go faster juice in the Camelbak and a GPS back up just in case we got completely wayward. 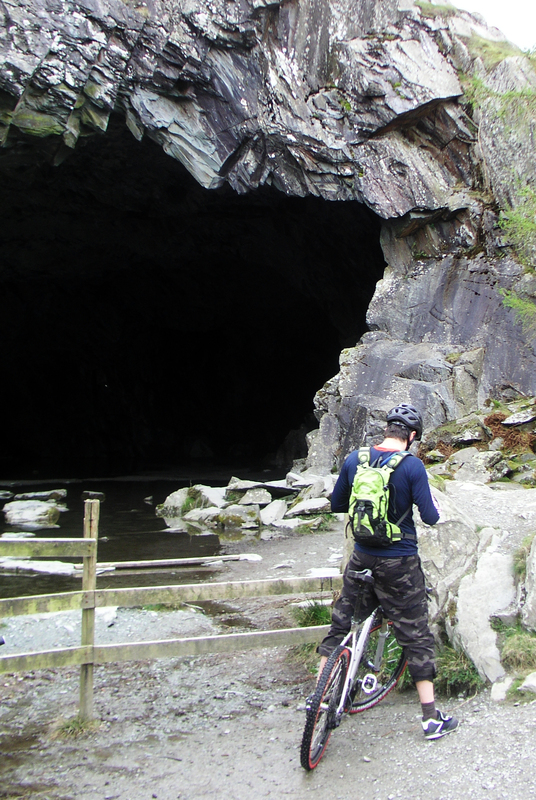 We circled around the car park and coasted out of Rothay Park following the River Rothay to Pelter Bridge and make the stoney climb to the caves above Jobson Close and quickly down the excellent trails to Loughrigg Terrace. 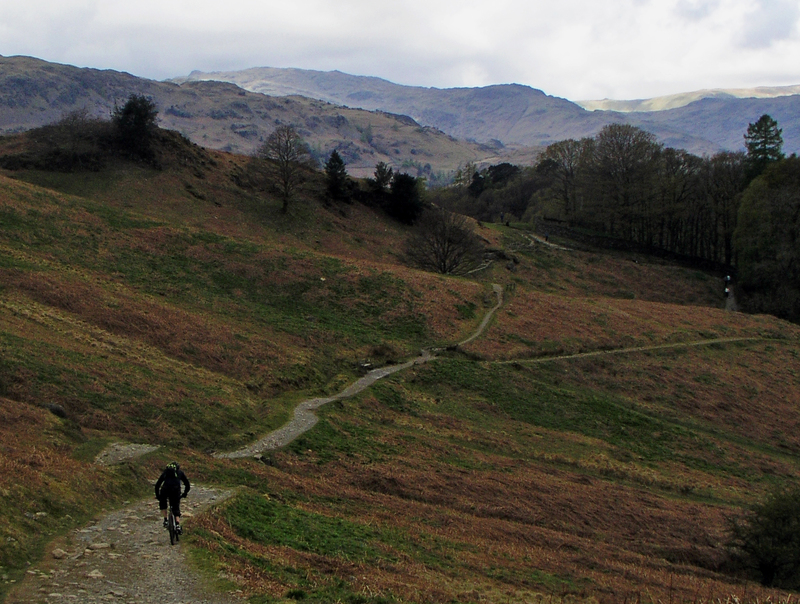 Down to Loughrigg Terrace toward Grasmere, but take the right hand track next time to avoid unrideable step up on the left track. Mick and I were surprised to see bikes out numbering the walking sticks. 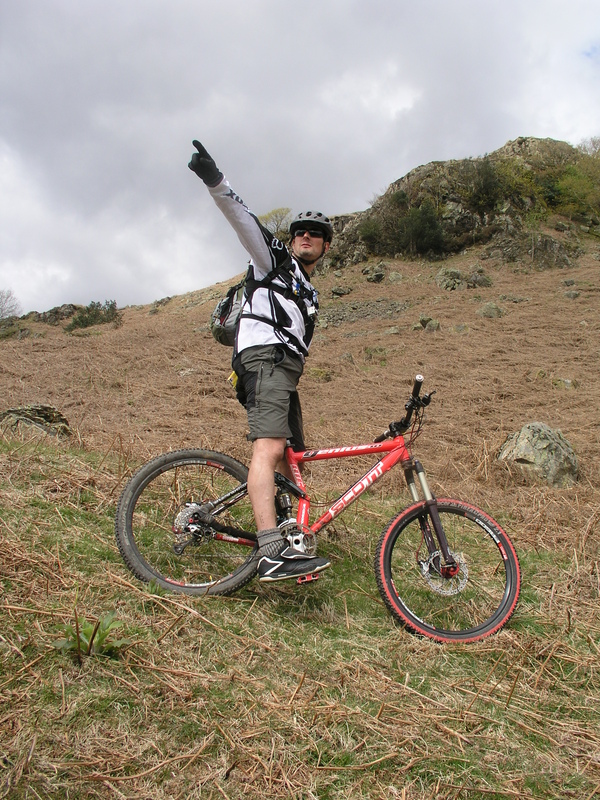 The trails around here are shared by both walkers and mountain bikers alike and from what I could tell were happy to do so. I certainly don’t mind, it’s on trails like this where your bell is your best accessory to warn walkers of your presence and that is the key to keeping a good pace. But I never forget to thank someone for stepping aside to let me by, provided I’ve still got a breath to do so. 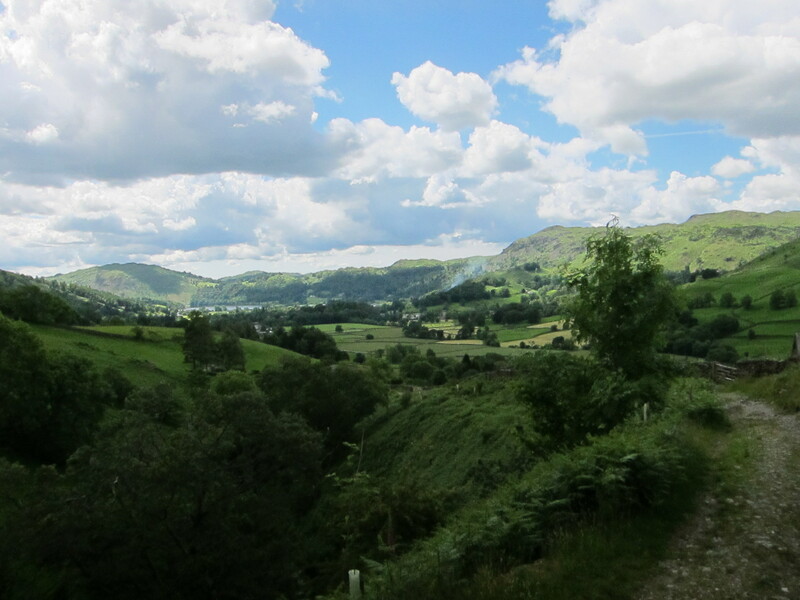 From Loughrigg Fell we made our way down toward Great Langdale. We did so but not via the intended route. 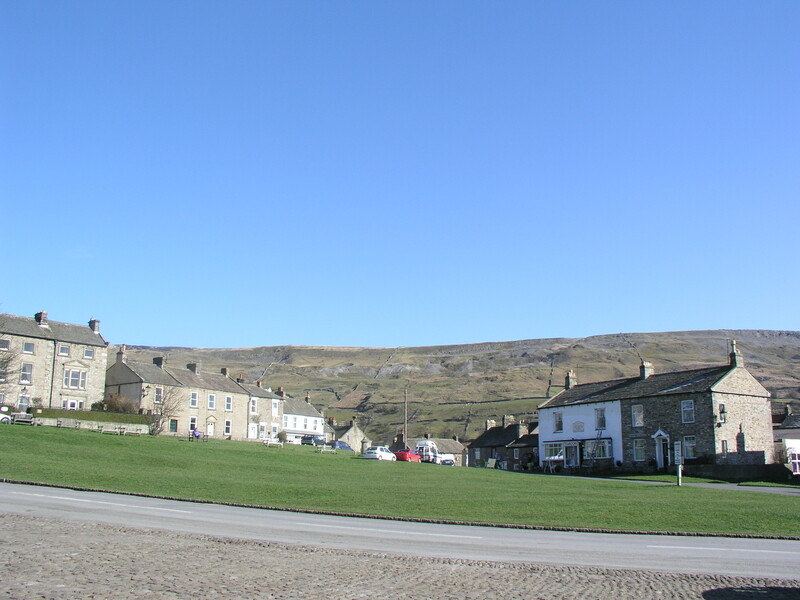 We’d missed the fork in the road that would have taken us left the long way down to the picturesque village of Chapel Stile. I’m not sure how much of a road we missed or was it a good track? I guess I’ll go back again to find out. 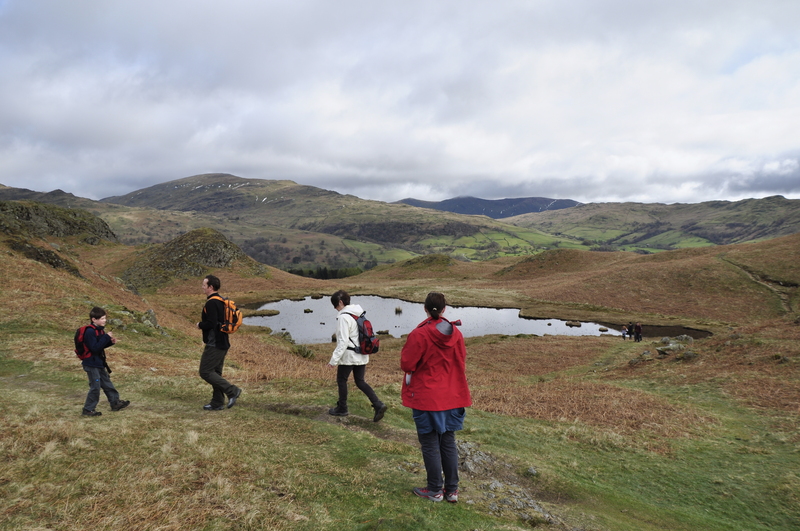 It was at this point that the weather looked like it was about to turn nasty so we ripped out the shell jackets, rammed in some sort of chocolate biscuit, and headed down the road above Elterwater and the walking section of the Cumbria Way. I point out the walking section in case you question why we did not pick it up to ride on. 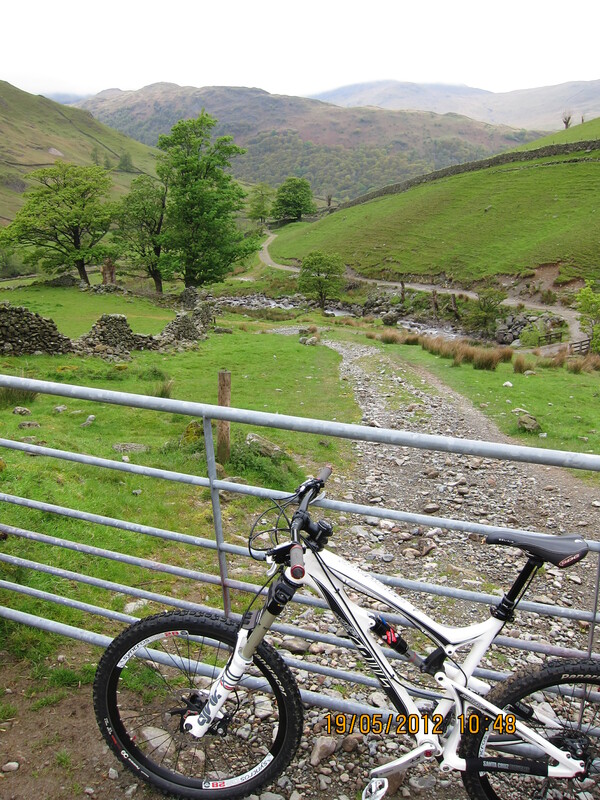 You can ride on parts and that part is found further along in Great Langdale . I can feel a tinker coming on. 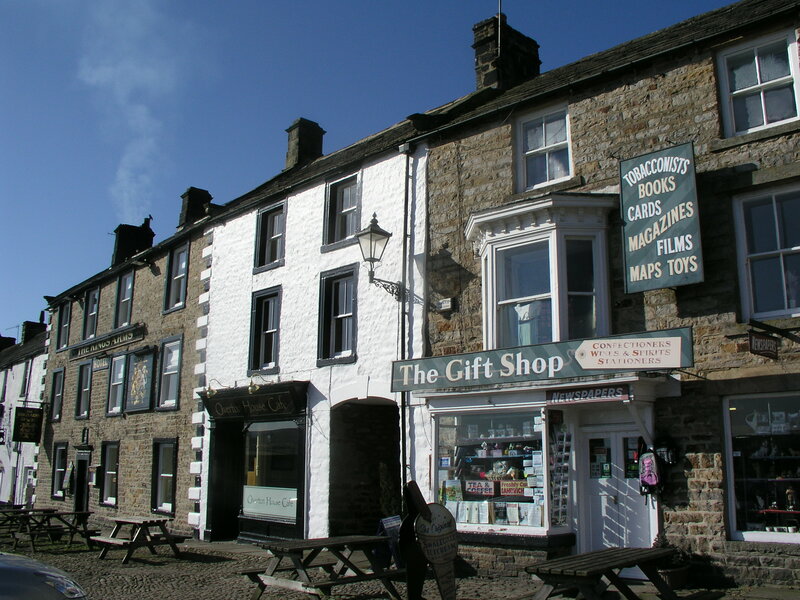 has these very distinctive slate houses that used to be home the quarrymen in the 18th Century. 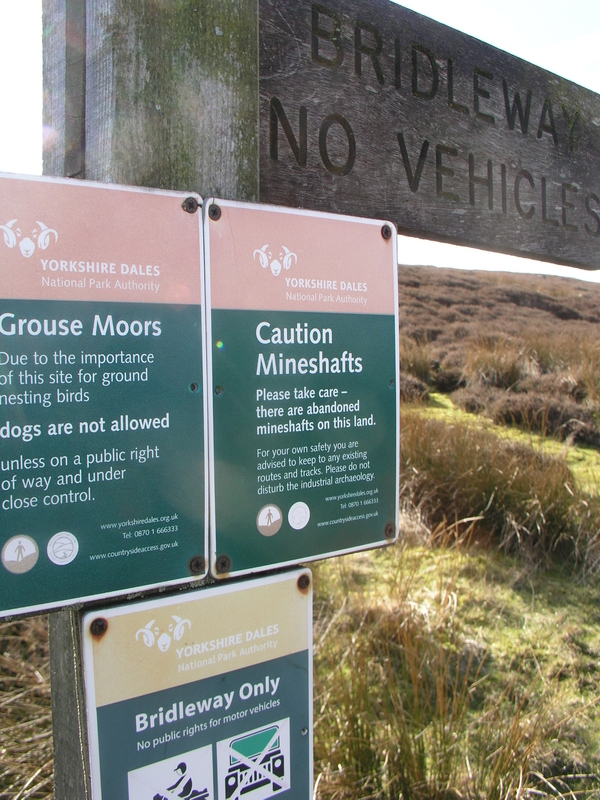 They mined the green slate nearby. Today it was the scene for an organised running event only today the runners would be dressed as Santas. At least that what one of the signs said. We didn’t spot any jolly old blokes, we were the only ones close to fitting that description and Mick wore a red coat too. This ride started out with amazing views that grew with each turn. 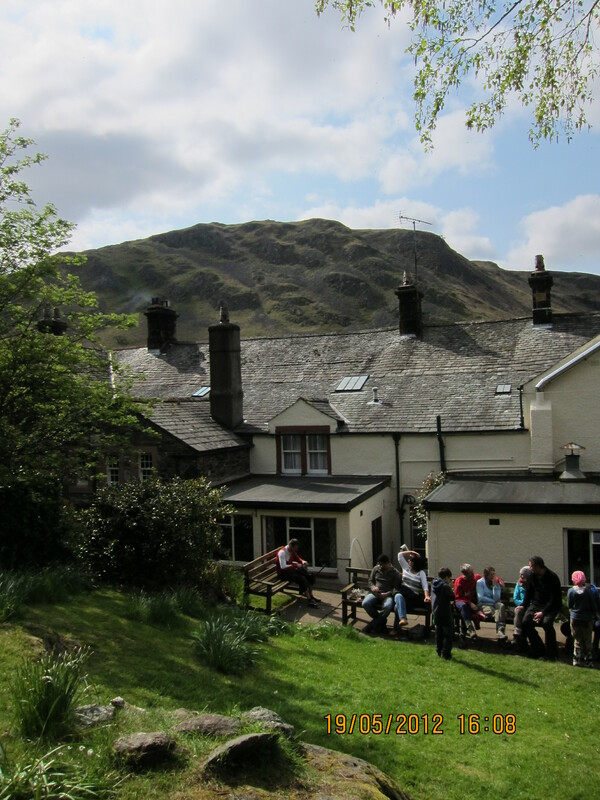 I’d never been into the Langdales before and now were beyond walking distance from Ambleside we were swallowed up by the stunning scenery that this area offers. Mick and I were in awe of the surroundings and feeling like we had escaped and were now somewhere very special and on our bikes too. This was my favourite view of the day. 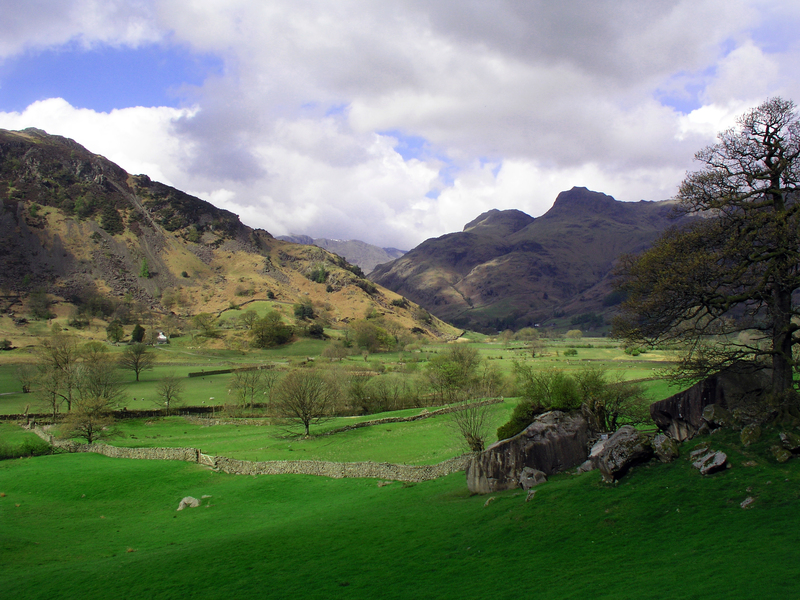 Lingmoor Fell left and Loft Crag and Harrison Stickle on the right from Great Langdale near Harry Place Farm. 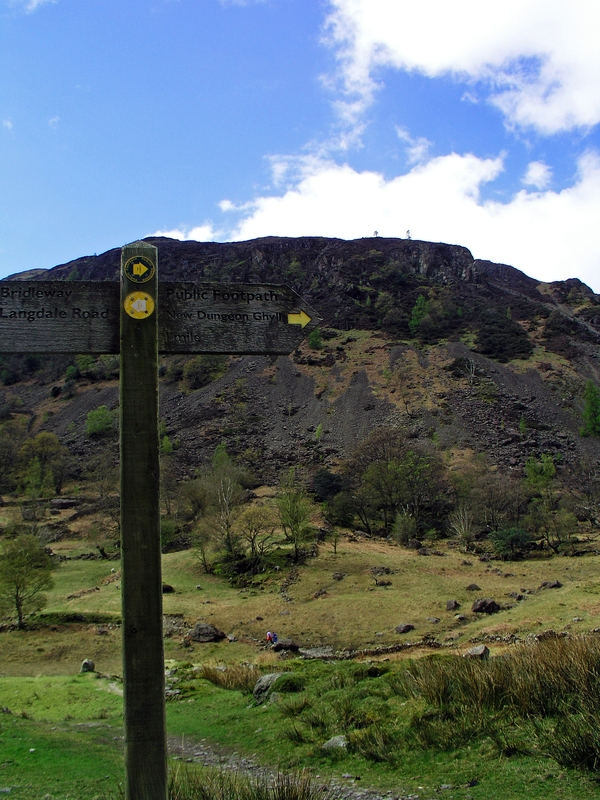 Understandably the Langdale Pikes are very popular with fell walkers, rock climbers as well as being irresistible to artists and photographers. 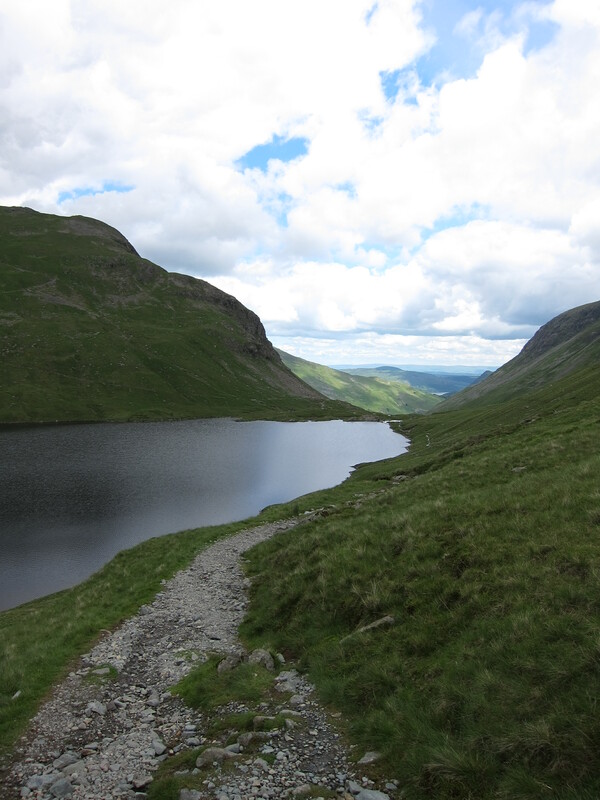 Alfred Wainwright wrote “once seen, never forgotten” which truly describes the Langdale Pikes. 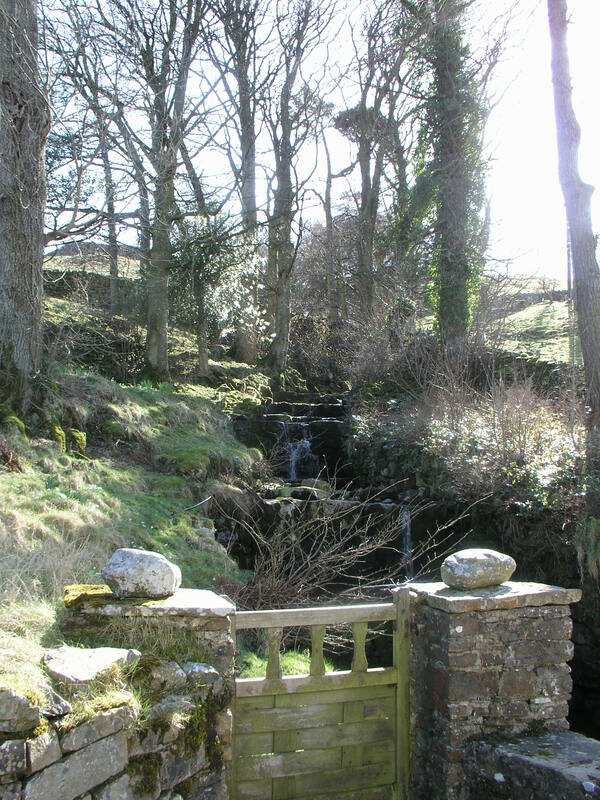 John Ruskin also described it as “the loveliest rock scenery, chased with silver waterfalls, that I have ever set foot or heart upon”. On a day like this I would agree. The clouds were scattered in that way that creates windows on sunshine that light up the fells in small parts that stand out of a scene giving it contrast, depth and interest. I could tell I was going to be reaching for the camera frequently today. 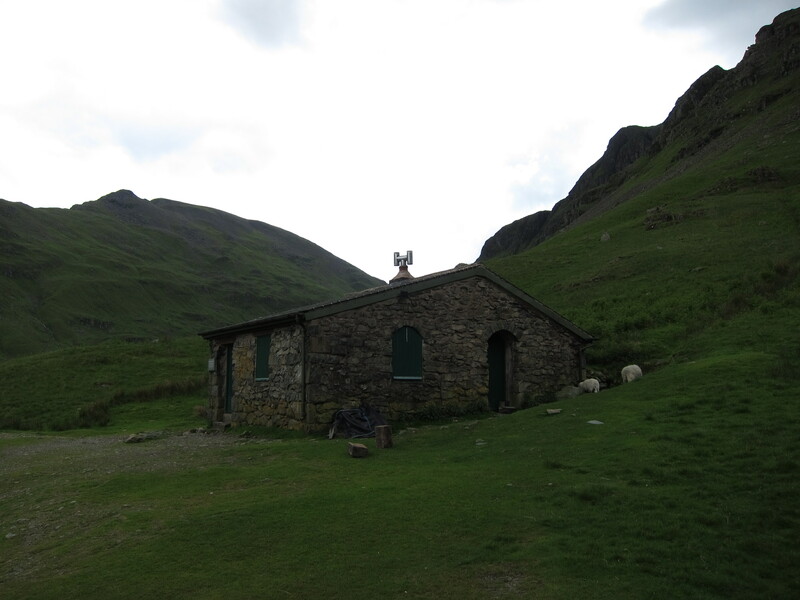 We turned left from the road at Harry Place Farm though the largest farm gate in the world and rolled down the wide track across the valley floor to the bridge over Great Langdale Beck, but not before flicking a sample of sheep poo from my rear tyre into Mick’s face. I thought he’d been eating my Soreen. 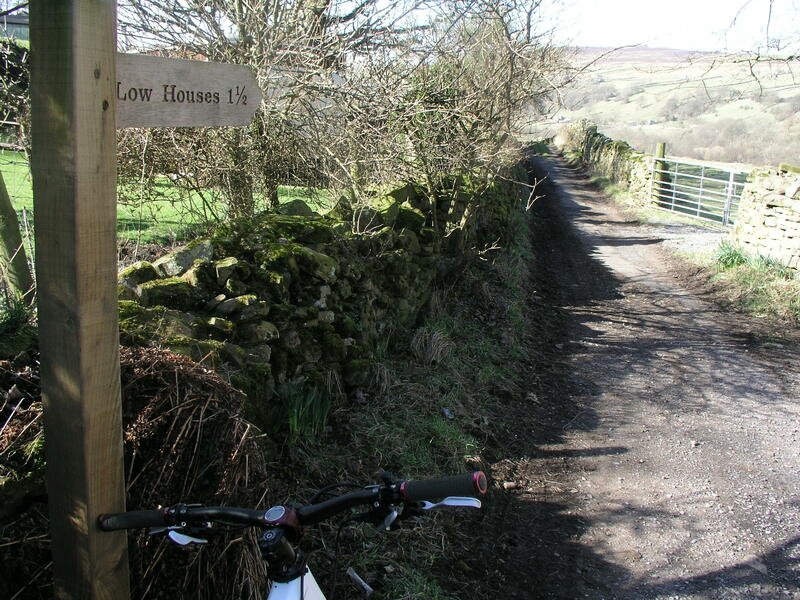 Back on the proper trails now which were just delightful to ride on for a mountain biker. 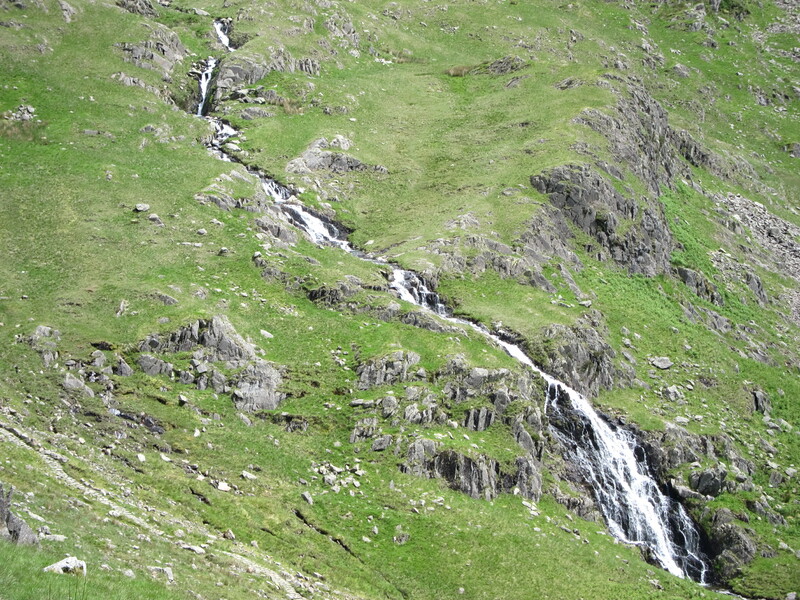 Up and down the gears through the becks and the streams. Jackets were off now, the shower was short-lived. I couldn’t believe it was not even lunchtime we seemed to have covered quite a bit of ground and were now heading into Baysbrown Wood to find a climb to take us over to Little Langdale. 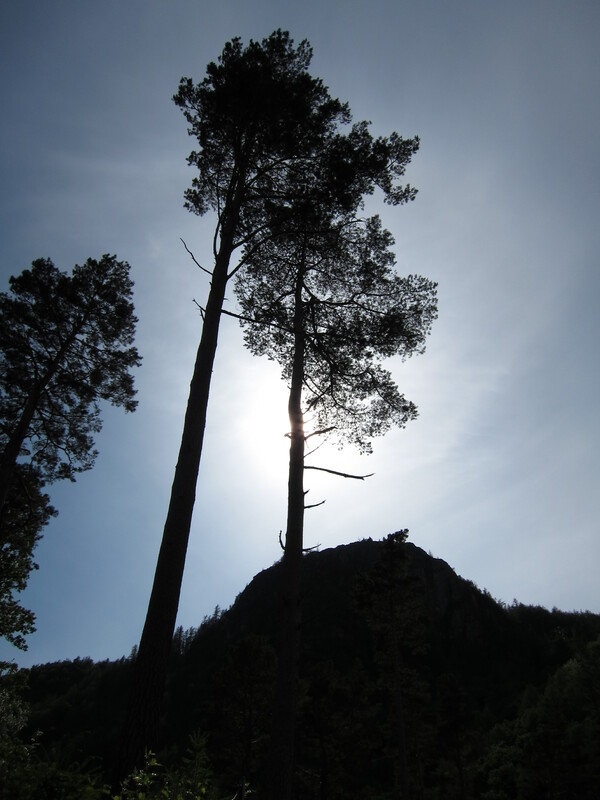 I clocked a bike rider on trail up on the left so questioned whether we should be up there. 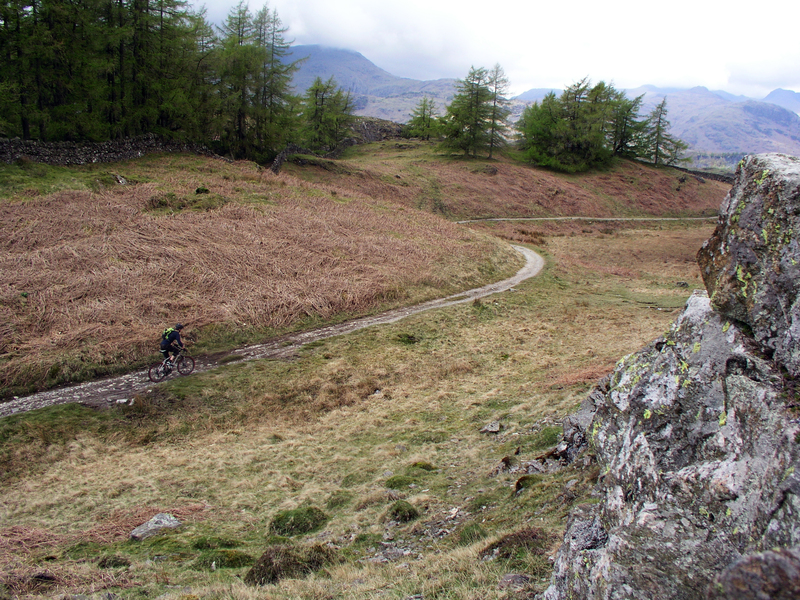 A clear bridleway was marked on the map about 400m before Elterwater Hall and looked on first impression like a better off-road alternative. 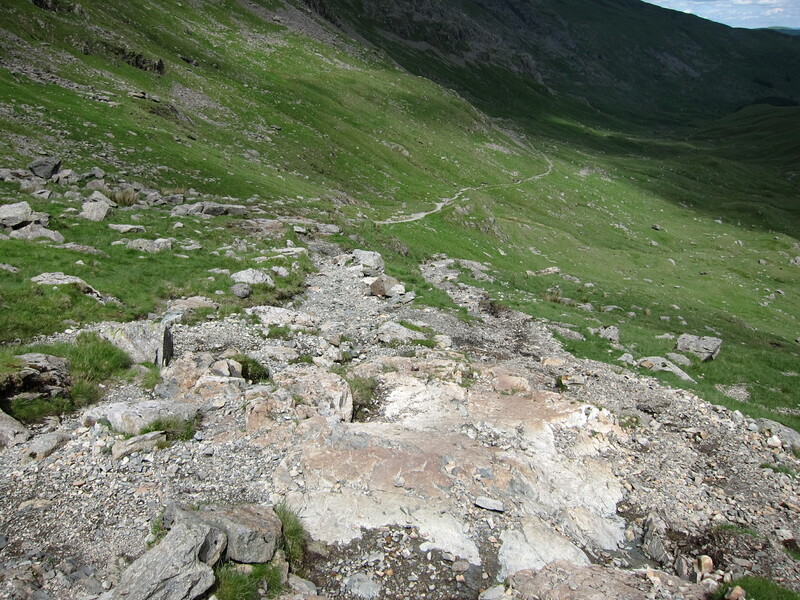 The climb was soon a G.O.A.P affair and reconsidered, but in a rush of enthusiasm I spied another track. 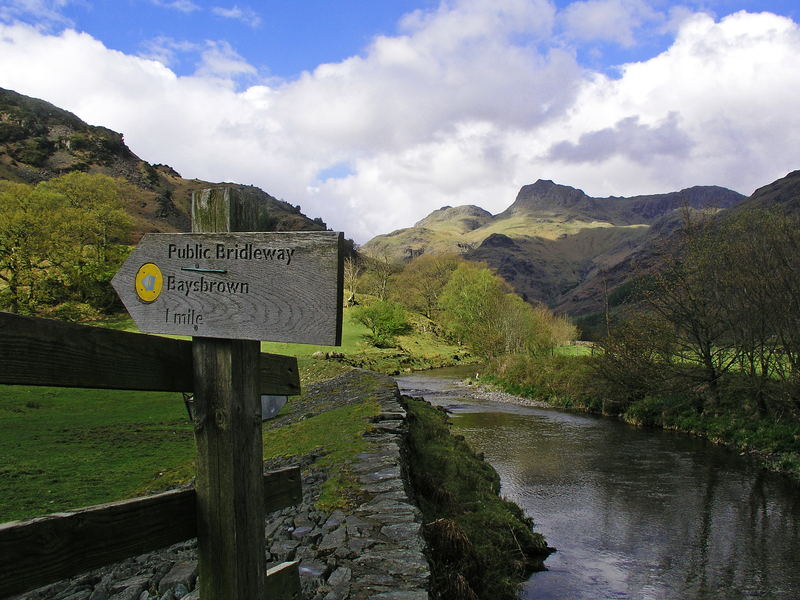 We dropped back down in front of a handful of walkers rubbing their index fingers over their maps and we peddled upwards on a fine-looking trail that I thought would take us up and over to Little Langdale. 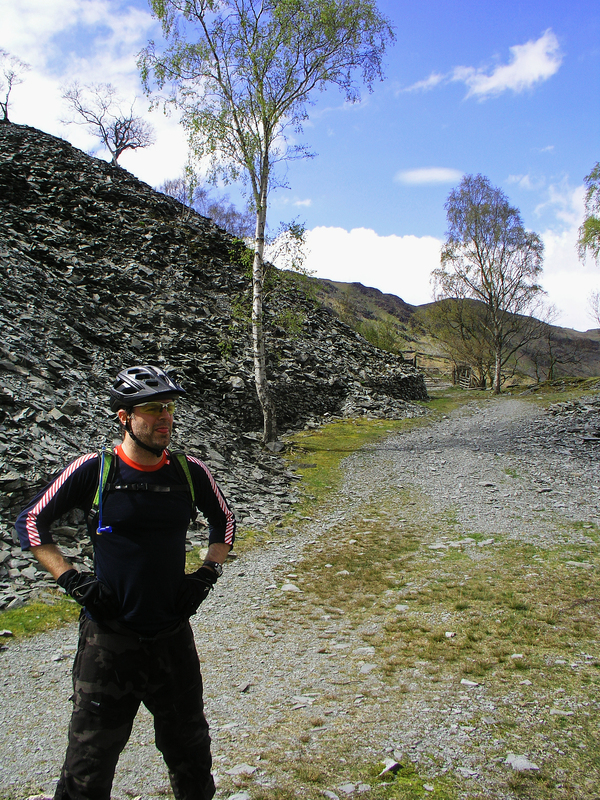 I didn’t and ended at the disused Banks quarry. 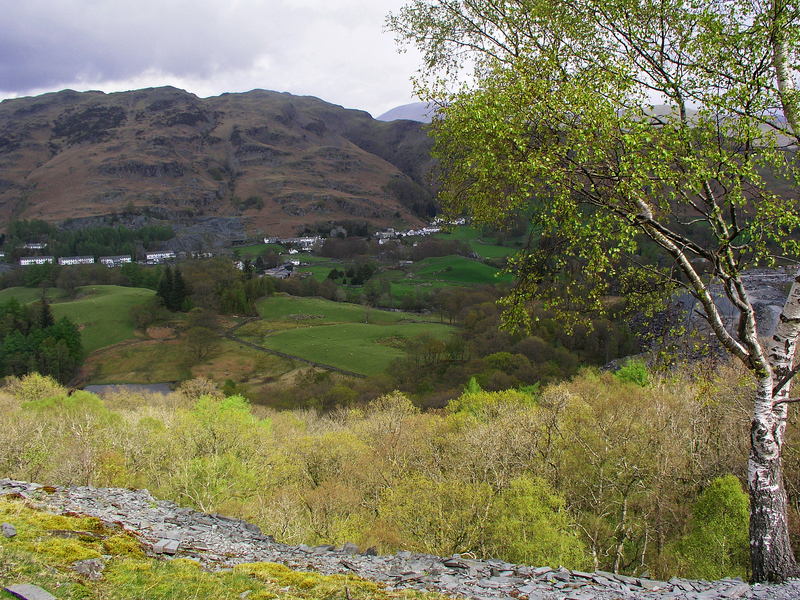 Still the view was worth the climb looking over the Langdale Valley to Chapel Stile and Elterwater village standing among masses of discarded slate. 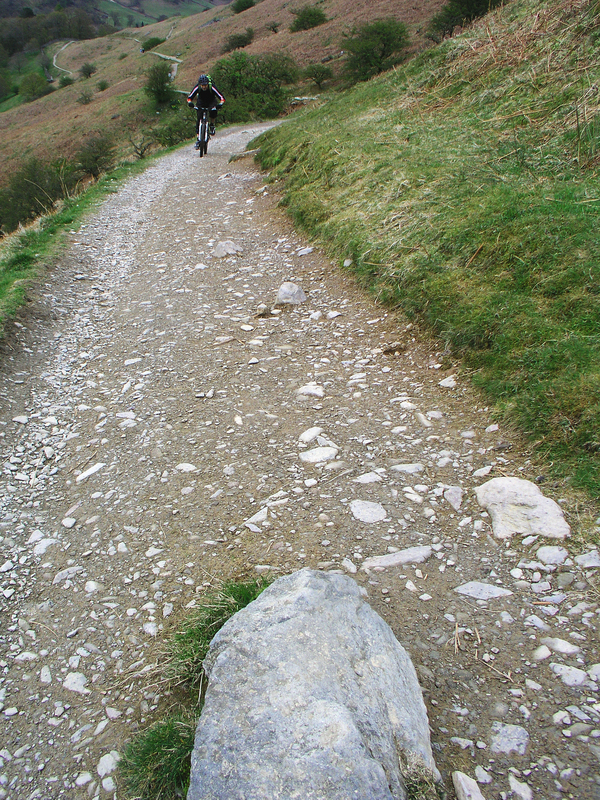 As we climbed I spotted a piece of slate just laying there on the trail that someone had scratched into it “Keep going”. That sort of thing really does not help the likes of me, I’ll take it as a sign that we are headed in the right direction. Which we wasn’t! back in the direction we’d come. 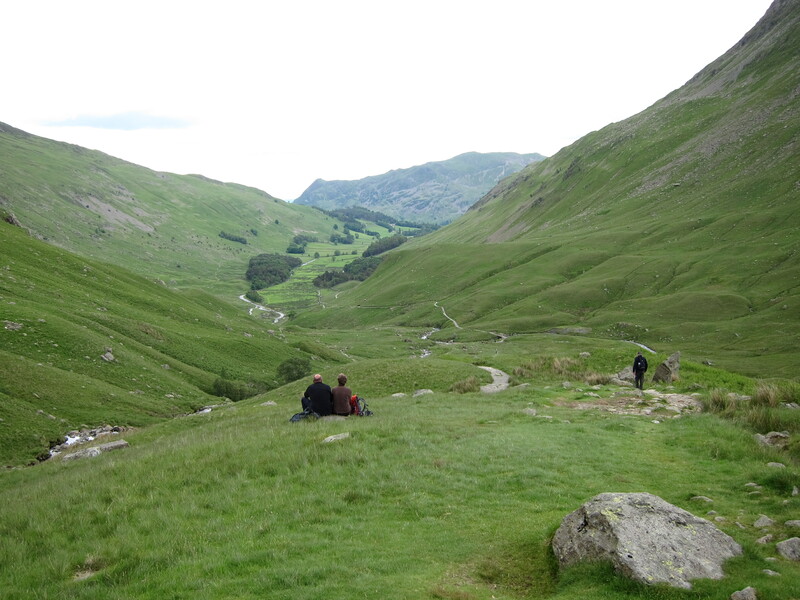 But all’s well because we a had a chance to blast down the excellent trail we’d climbed. 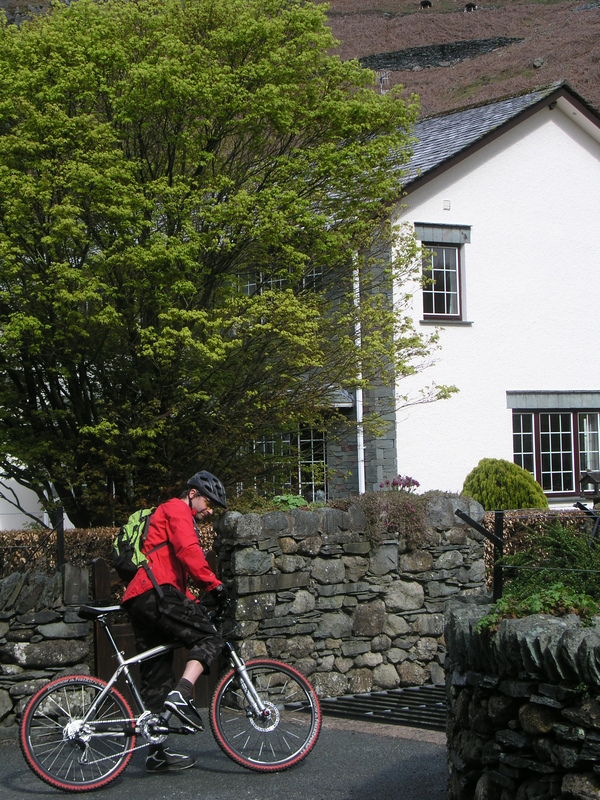 We correct ourselves and dropped swiftly into LIttle Langdale steering away from the pub, to crack on with the riding. 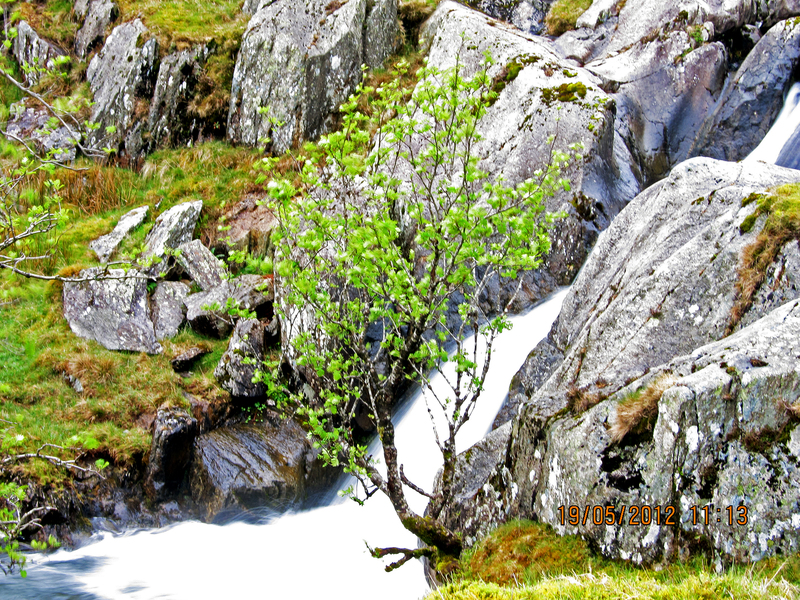 We crossed to massive ford of Greenburn Beck and climbed over more slabs and slate to Hodge Close. 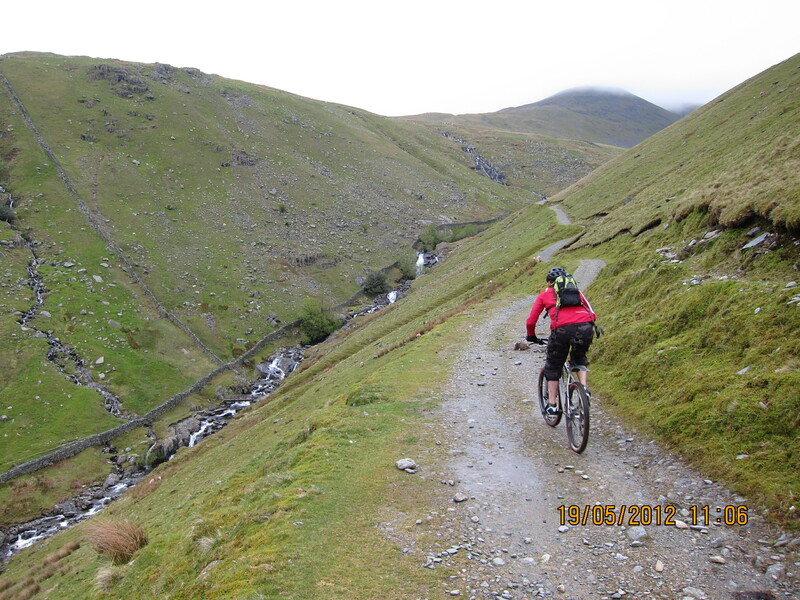 Mick and I were enjoying the technical climbs that permeated the ride now. 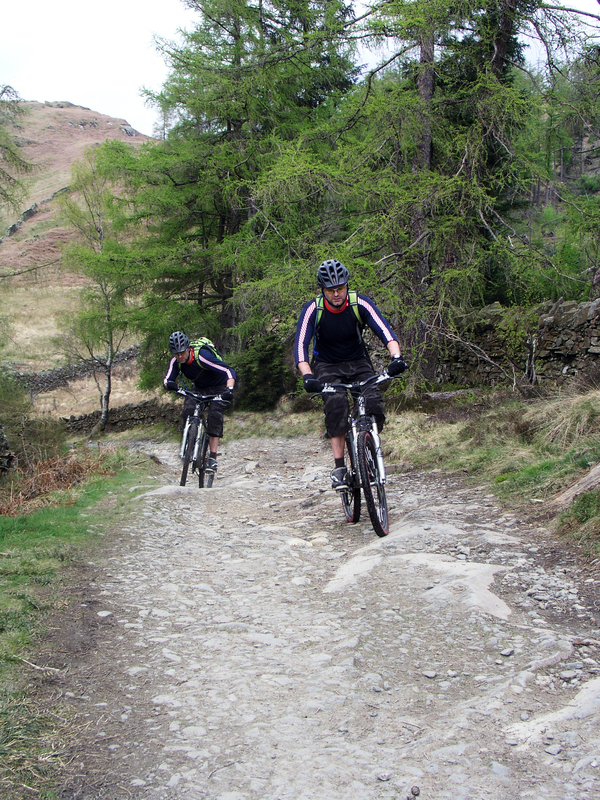 Challenging each other to clean the climbs without dabbing. Some dubious cheating from myself using the stone wall to balance a bit but in a way which I thought was acceptable. 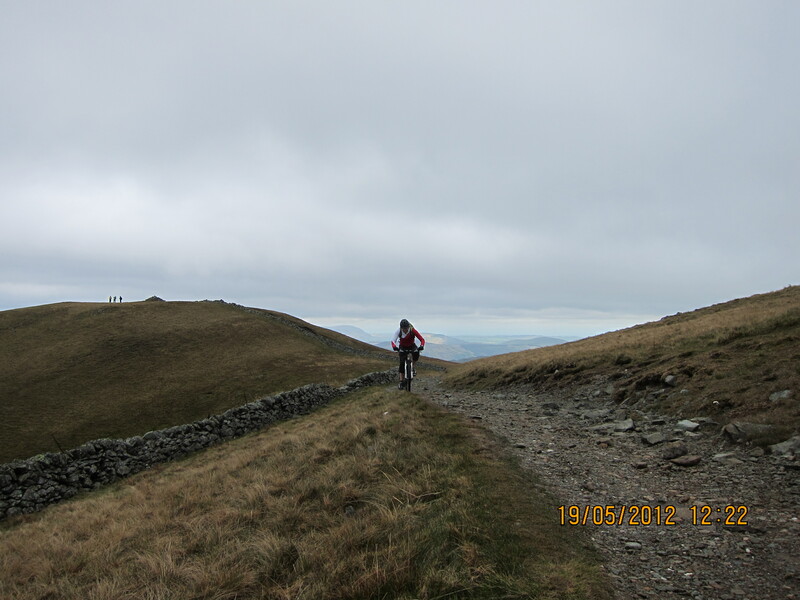 From here on we were climbing for Iron Keld around Arnside Take the highest point of this route at just 266m. 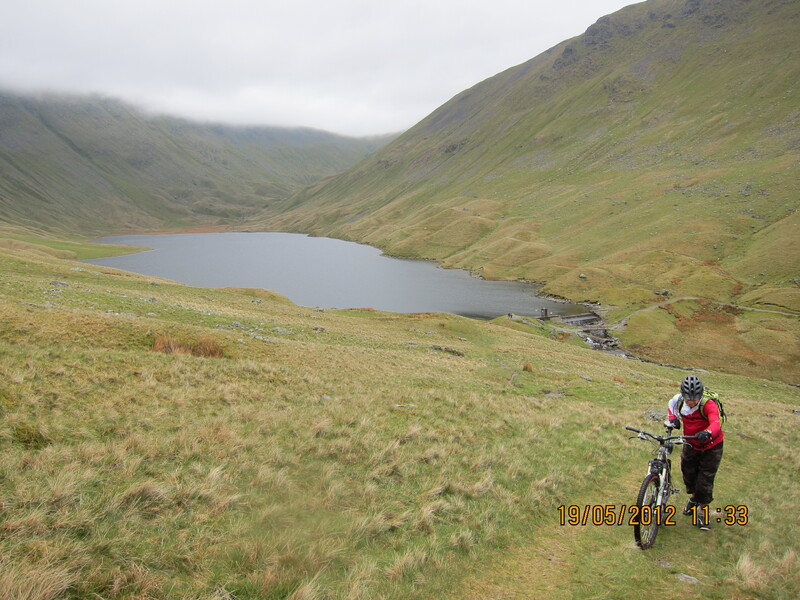 We’d make this our rest point before the long steady descent to Skelwith Bridge. Somehow I’d managed to make right old monocle of my glasses, and left one of course. 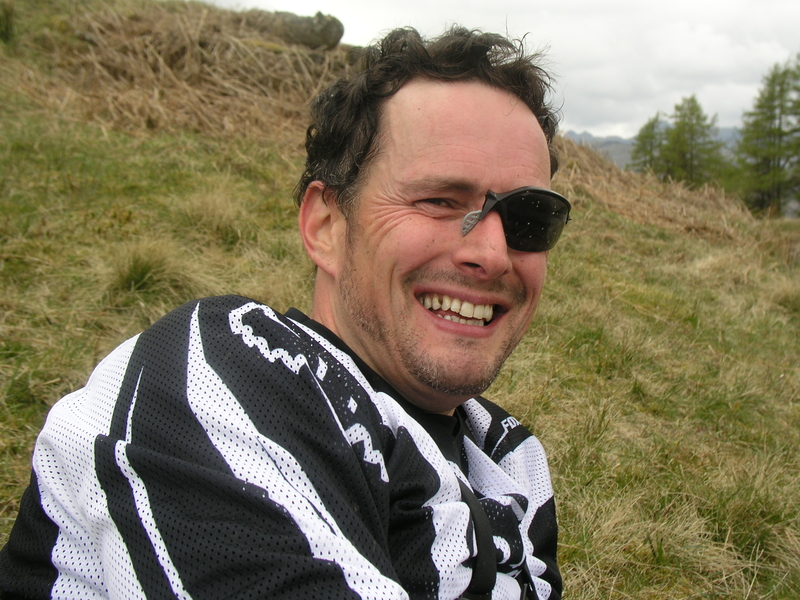 Fortunately Mick had a spare pair and took this shot complete with helmet hair and malt loaf teeth. Very fetching! I wanted Mick to set off ahead of me so I could set up a shot him on the meandering trail. I used to say photography gets in the way of the riding, I’m not so sure now, I think they go very well together. The next part of the ride was just superb. 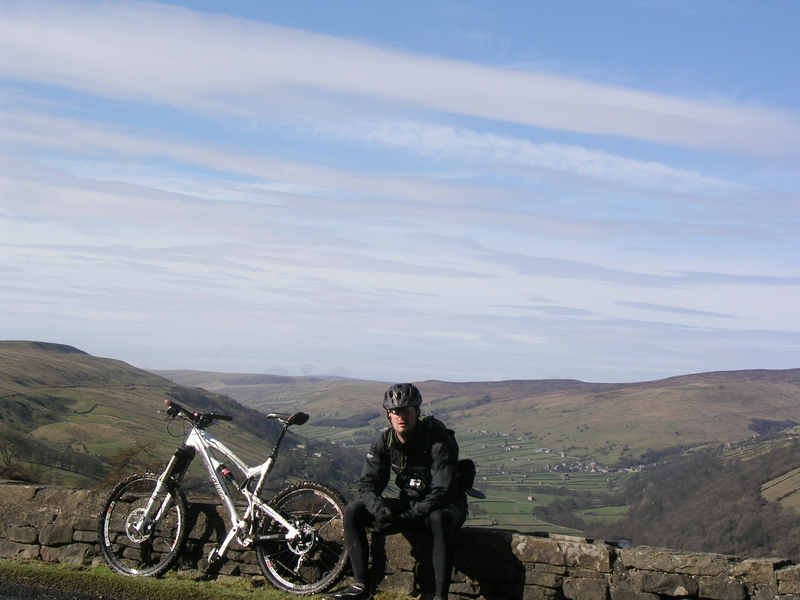 It had everything a trail riding mountain biker could ask for. 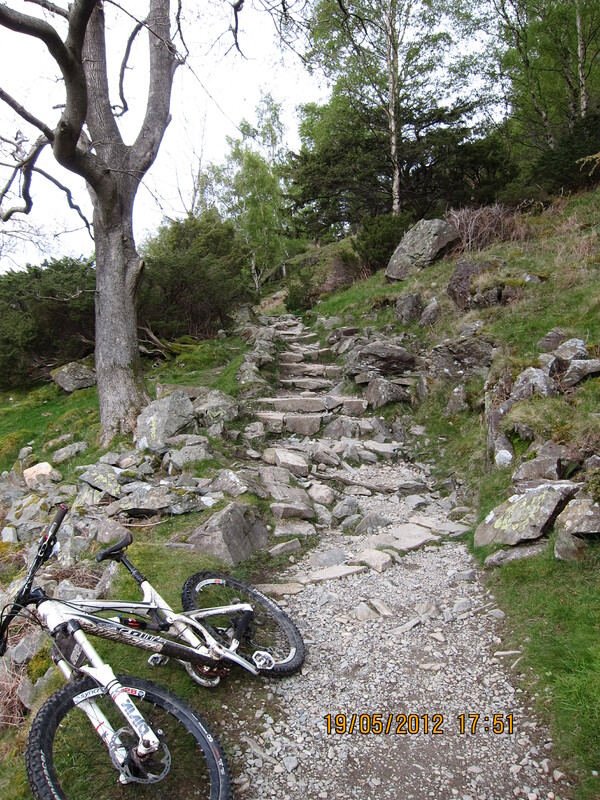 Narrow single track, stone and slab kickers, open grassy power ups into more step and drop offs. More variety than you could shake a stick at all in a non-stop descent. I did nearly throw myself over the bars. Not sure how it really caught me off guard, I just remember being launched forward I presume I had my seat post locked up to high. I’ve got out of the habit of lowering the post on downhill sections since I had been used to the dropper post in the Nomad. I really did think I was going off in a big way too. 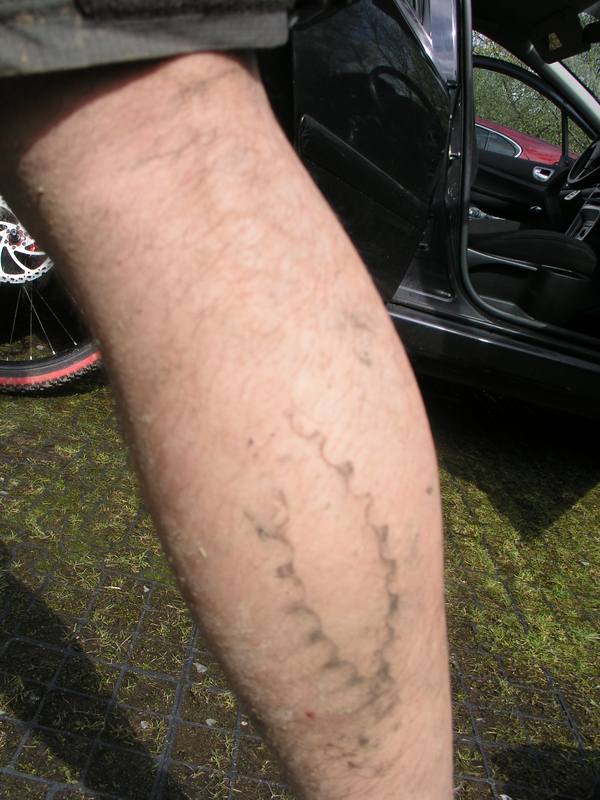 I’ve never had any high-speed crashes, more lows speed dismounts over something technical. I was lucky today to get away with it. I did video of the near miss but it didn’t look so bad from a pilot’s view. But was enough to turn my stomach at the time. What I could have landed on was not in any way going to be a soft landing. Stephen How and I nearly went over the bars. 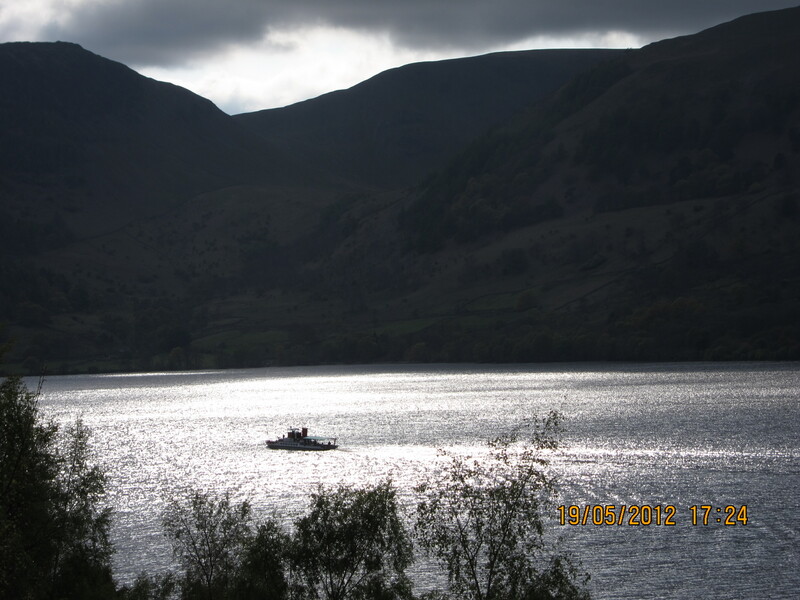 Is that Ivy Crag over there? 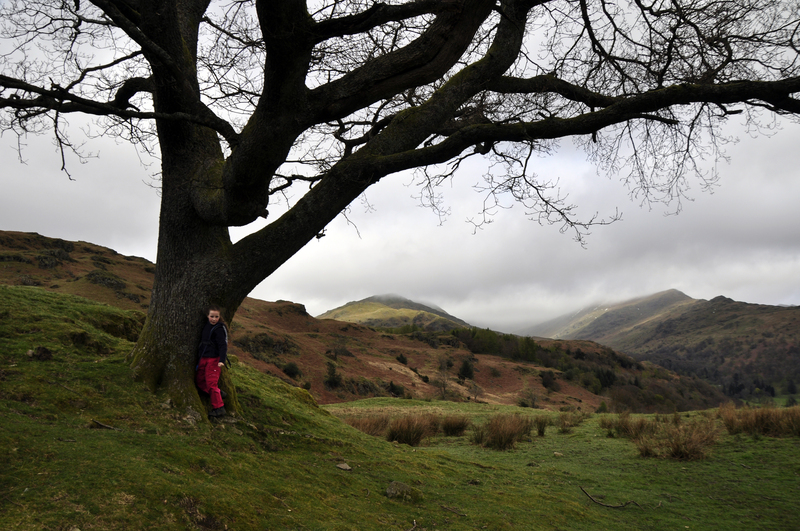 No that’s Ivy Crag behind you. 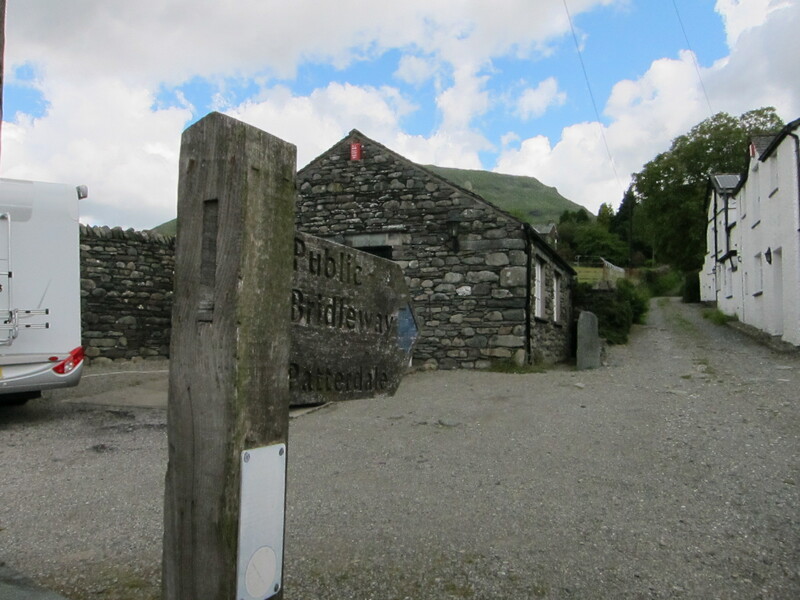 on the last leg now to Ambleside. I was just beginning to feel the onset of some muscle fatigue after all the climbs were steep and I took this as a personal fitness marker for future rides, given that they are planned to be less forgiving than this route. 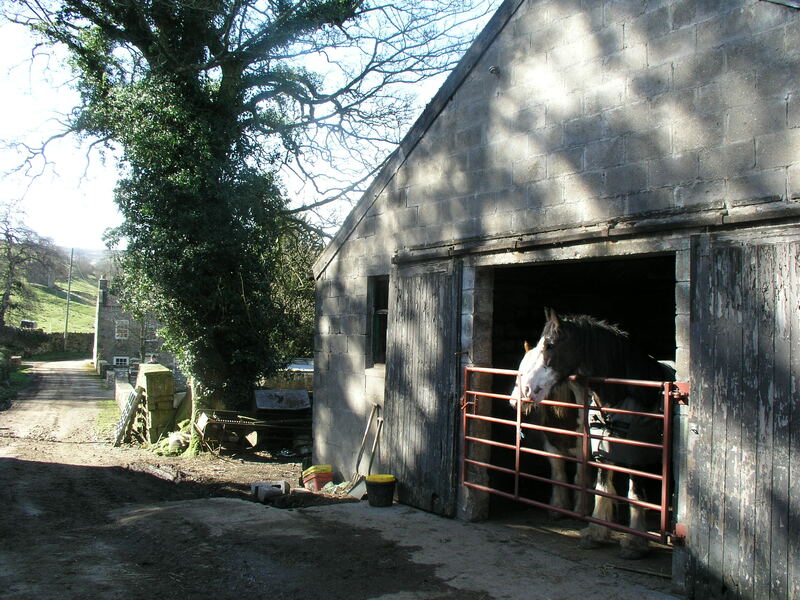 Mick was feeling good about his conditioning, affirming his daily commute to be paying off when you get into the places that are more demanding. 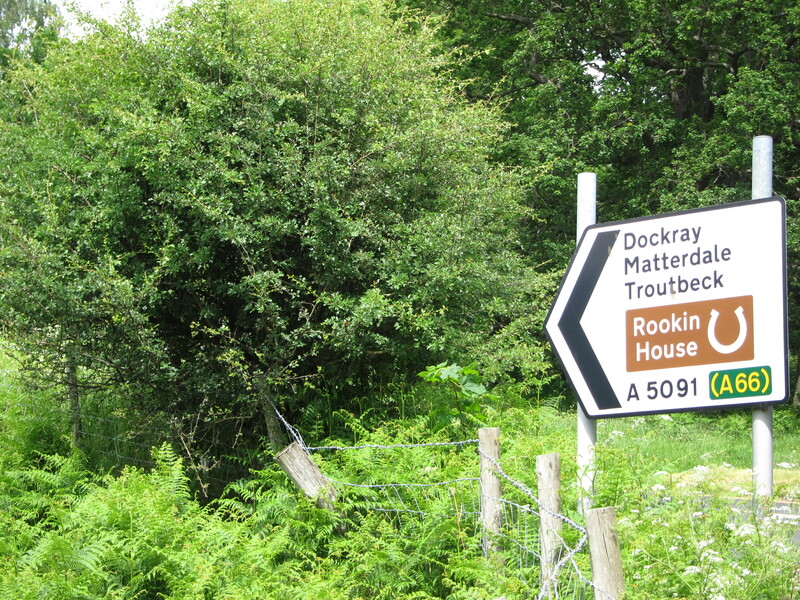 Once we climbed again onto Deer How it was all downhill from now on to Rothay Park. What a screaming descent that it. Did this ride just get better? It was in all without doubt one of the best. 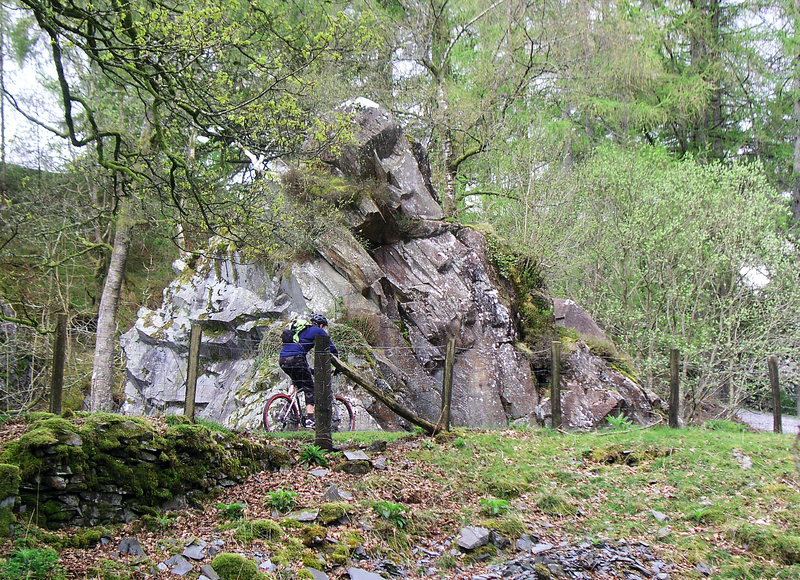 This area is superb mountain biking territory. I wouldn’t hesitate for a moment to go back. 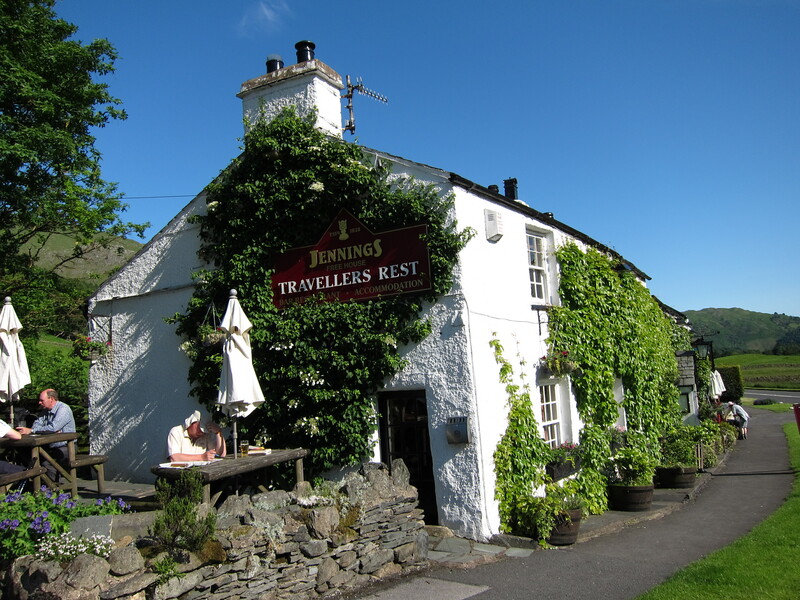 It’s on the list for a re-visit so call me up if you want to explore the Langdales, I’ll take in all the navigational foppery as well, it would be hard to beat for all out variety and scenery. 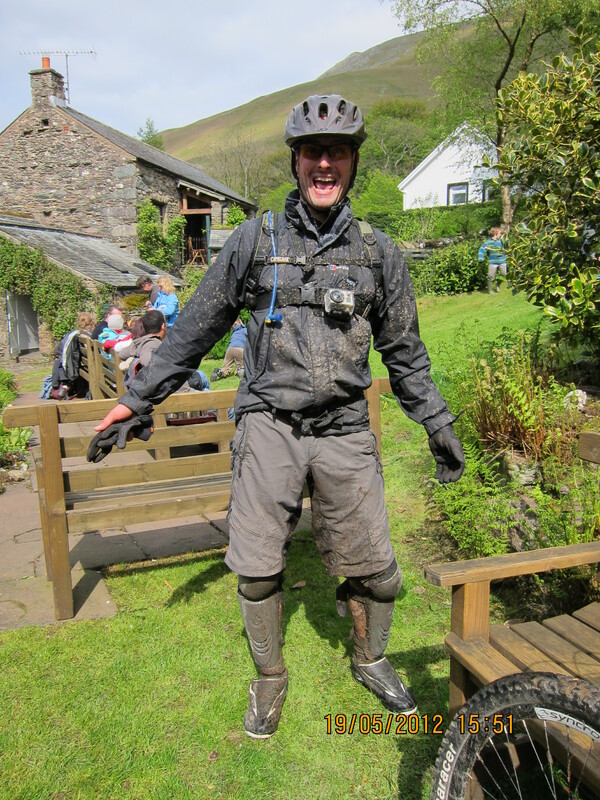 in skin-tight get up, I couldn’t help but feel they were missing out on something, they couldn’t take their bikes into the places we had and that’s where mountain bikes can get you, deep into the wood and disused quarries, over the fells and crags and high peaks that is the attraction of this part of England. 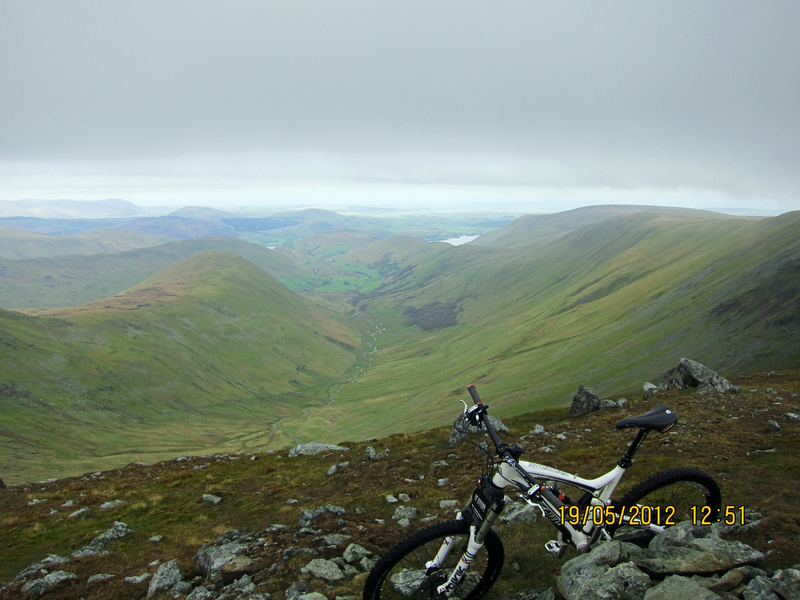 I love it and can’t wait for May to get up really high on High Street for more bike riding over the bumpy bits. Sorry lads, you can keep your spandex and skinny wheels! Clicky here for some Go Pro video of just a few of the best bits. Smaller alternative to the big mountains but with all the charm. So what do you do on Easter Sunday? The weather has returned a wintery reminder of what April is supposed to feel like. Showers and dismal looking clouds on the move to find someone else to drench. I guess that’s the thing about putting a walk diary together. It’s often said if you want to be sure your are going to do something then you should write it down at least because until you do it’s just an idea. As many S.M.A.S.H. companions may have learned that’s it unwise to forecast the days weather based on what one sees from the cosy confines behind their bedroom window. To be fair, for a moment I had second thoughts about making a move into the grey outside that I woke to on Sunday morning. 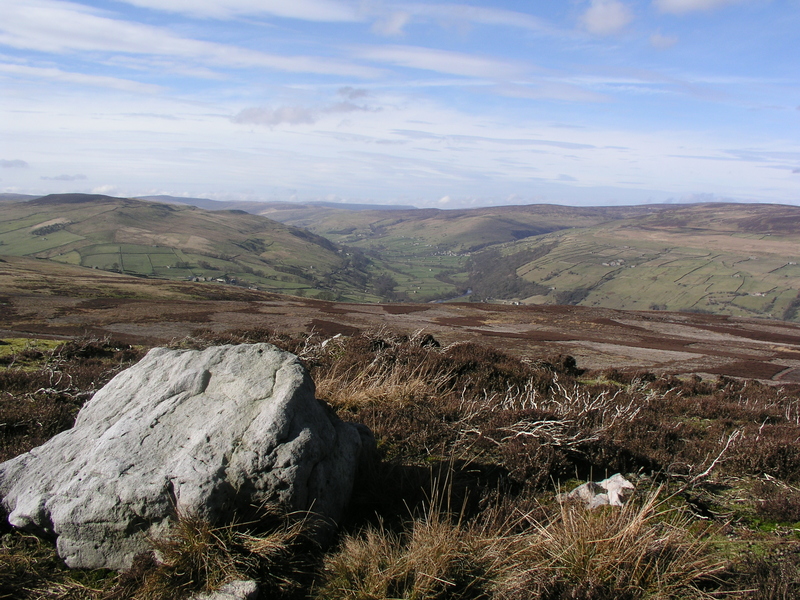 It’s always a different matter once you cross the Pennines, the arched spine of the country that gives rise to two weather systems, one either side. I reminded myself of this and gathered the last of the necessities and pressed the lot into the car boot and made for our normal meeting place. My walking possie today was a small handful of friends and family. Keith, keen to pop his SMASH cherry having kept abreast of our outings during his time in Dubai and just about anywhere else you can imagine at least where you can get an internet connection. Keith had been bigging his mum up about her extraordinary walking ability earlier in the week and enquired as to whether she could be considered able enough. Well we shall just have to see. Jean was soon being referred to in mind mind at least as Keen Jean. She’s one of those naturally energetic looking people. Sat in the passenger seat wound like a spring ready to go dressed in a casual easy to move about in kind of way.The rest of the crew were home brewed. Lesley and the small people. Jack and Emily didn’t even enquire as to where we were going, they just know they are going for a walk and they love it when new faces turn out so they can show them how to go on and tell them what they’ve done so far. 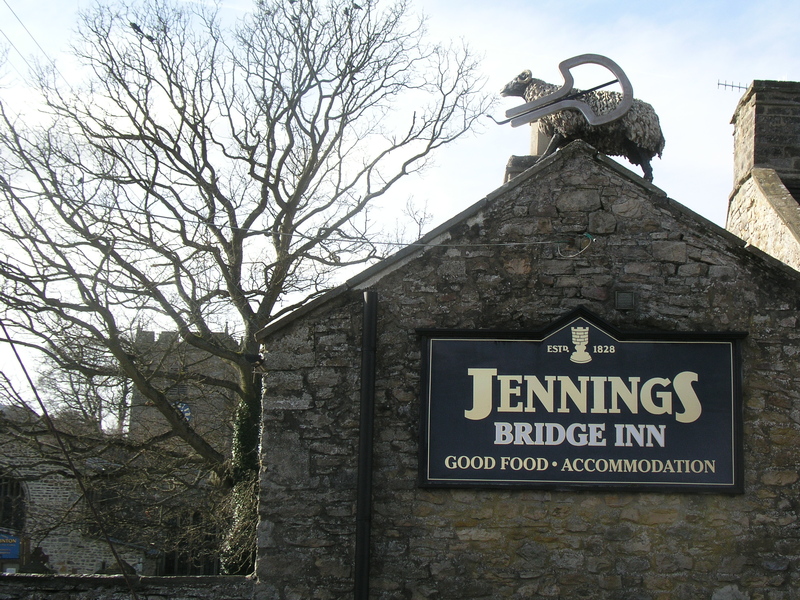 We set off at 08:15 and arrived in Ambleside at 10:15 booted, bagged and baited at 10:30 as well as robbed on a bank holiday for parking, but in Rydal Road carpark that was quickly begining to fill was a heafty revenue not to be missed by the local council I guess. 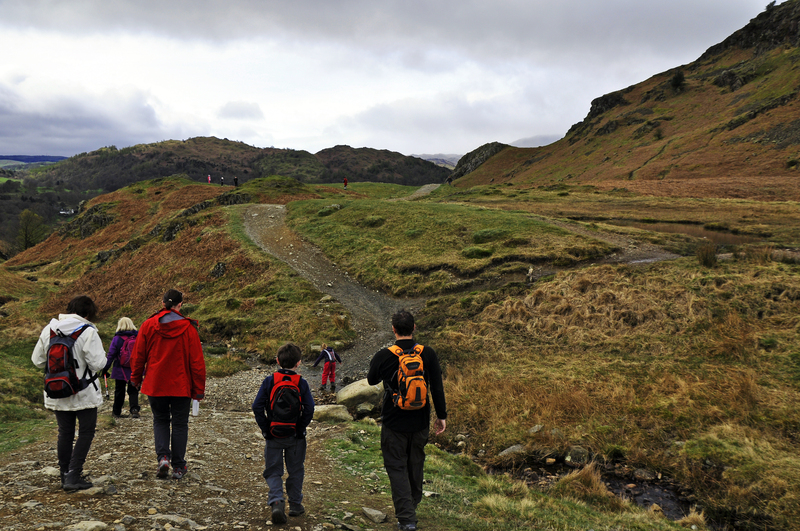 Loughrigg is to Ambleside what Catbells is to Keswick in that it brings out all the families keen to tick off their first proper mountain and fell runners out for a mild challenge. 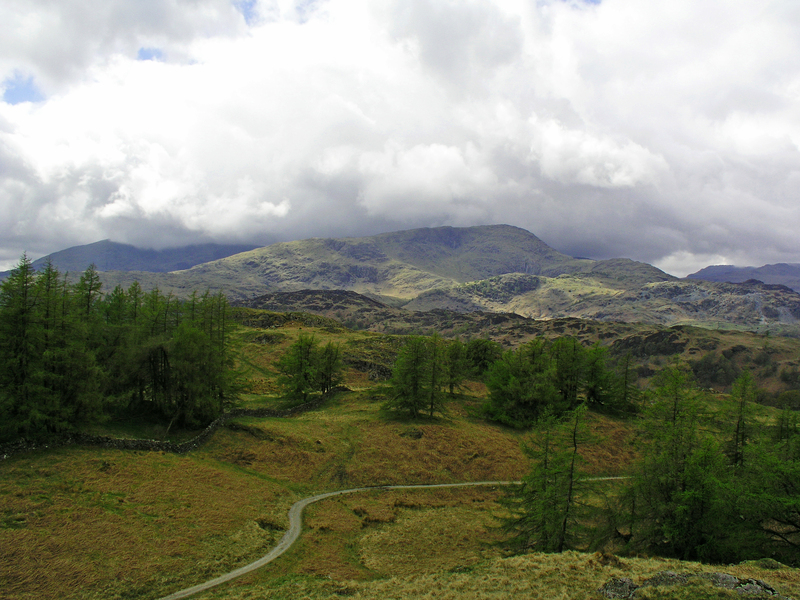 Though I still think of Loughrigg as a hill. It’ll struggle most days to loose its head in the clouds and thankfully today was looking like one of those days. 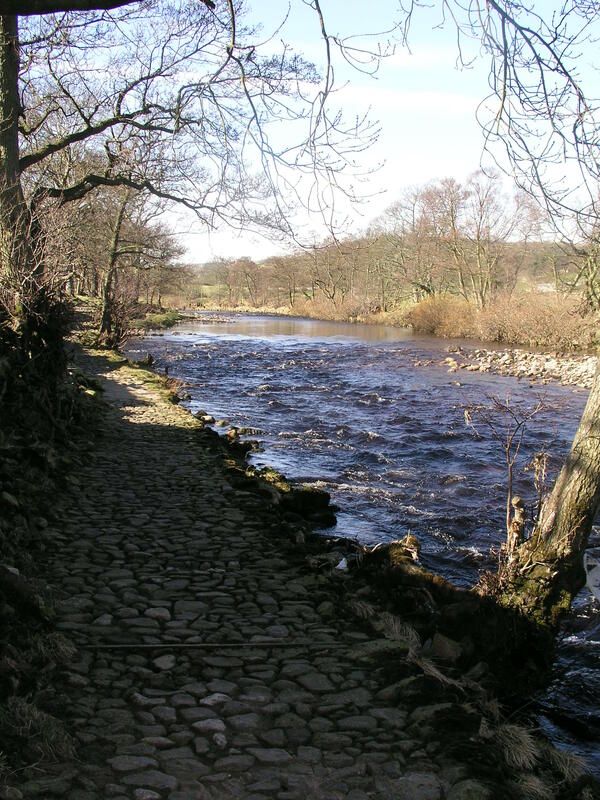 There’s a different feel to this walk as it takes a while to get away from the of the town. Walking past the shops on Compston Road, the school, the church in Vicarge Road into the park all full of busy. Emily desperate to climb anything. 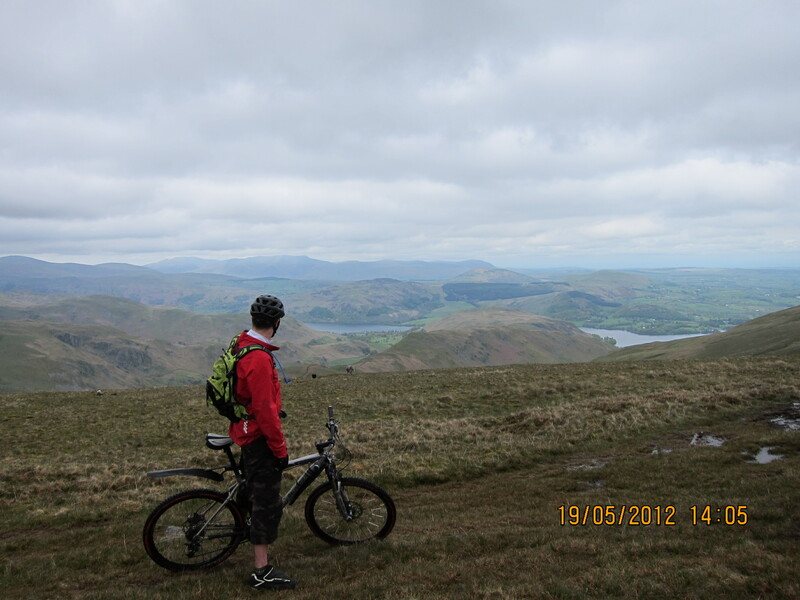 Low Pike and Red Screes in the background. We cross the packhorse bridge in Rothay Park onto the lane and then begin the zig zag climb up to Ivy Crag now following the small people. Checking around to see every one was not giving me one of those “you said it would be an easy walk” looks. I think everyone was fine. I didn’t want to make anymore promises that would later be used against me should anyone turn round an back out. Jean looked comfortable, in fact more so than Keith, but Keith always had that eye of determination that one has when they come out with someone close to them. 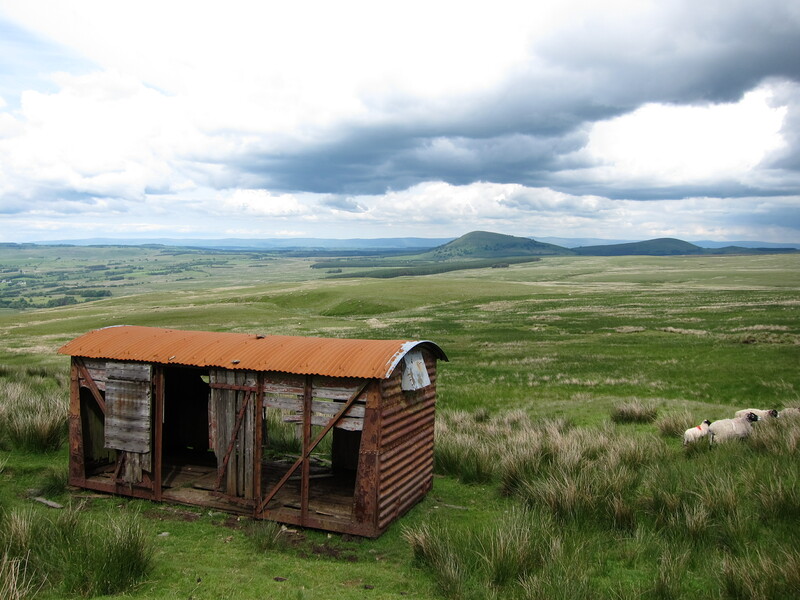 Keith joked about getting off his bike and pushing last friday in the moors but what is there to get off when you’re already off. Collapse on the floor I guess in front of your mum? No way. 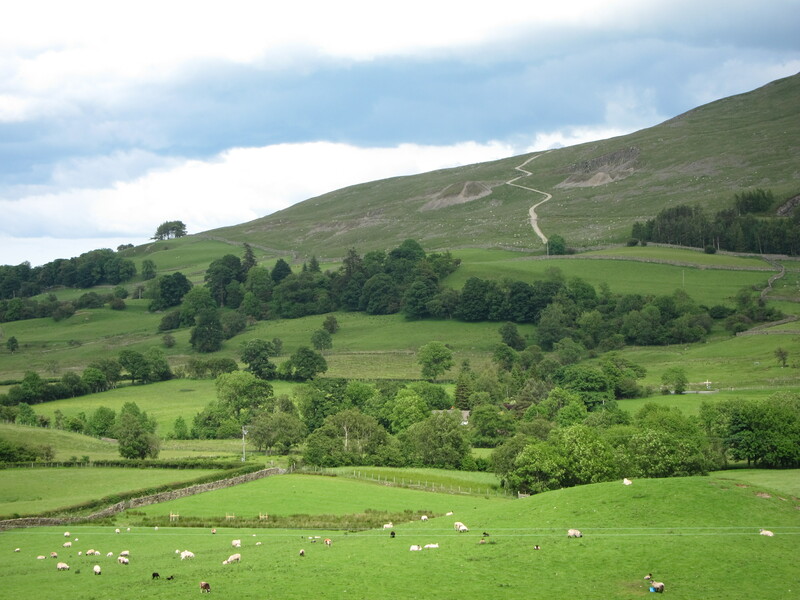 In no time at all we were onto the fell proper holding gates open for other walkers was now par for the course. Though Emily preferred to just climb over them than to simply open them. No one likes a show off. enjoying the hill as we were. 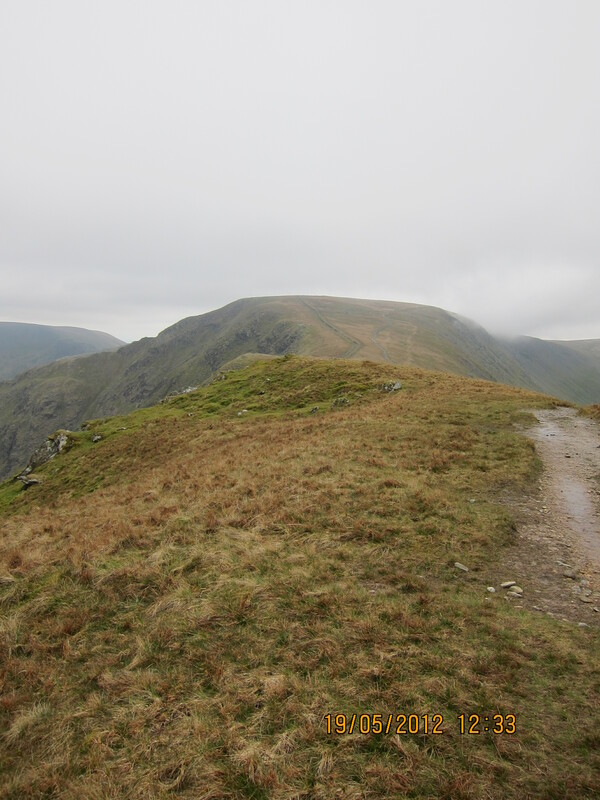 All manner of disciplines from casual family walkers to hardened fell runners all impeccably polite stepping to the side if you had a pace over their own. 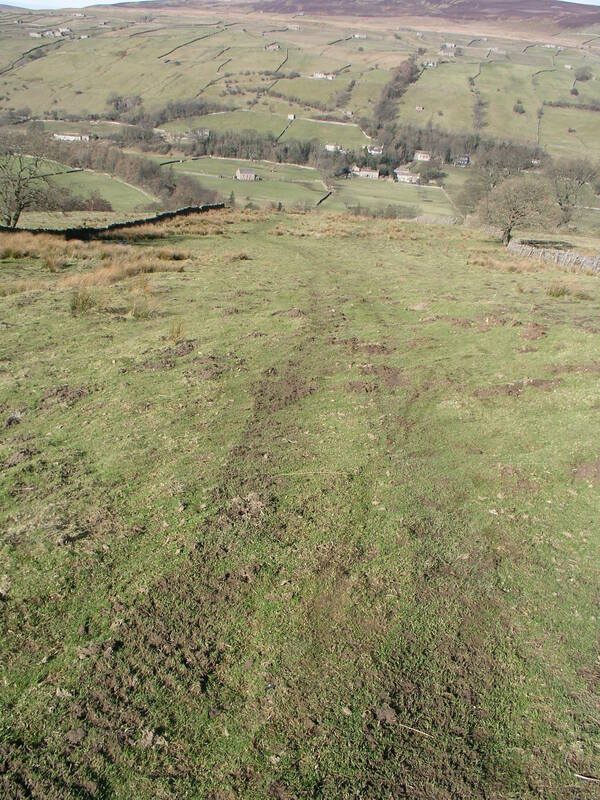 I think Jack’s early attempt at chasing down a fell runner was borderline rude though overshadowed but the comic value. We wondered how far he’d go to keep up with him. He excused himself the humiliation, conveniently distracted by a tree that looked like it was worth climbing. So he let the fell runner off. Already the summit was in view and this came as some surprise to Lesley, she was enjoying this walk, especially as Jack and Emily were so lively and energetic. We took our time though and this is something I felt I needed to work on. Good advise from Lesley. I know I have a default pace which is one that is set to push myself so that I actually feel like I’m exercising rather than walking. The Oblitorator…of cairns and chocolate coated condiments. just puts a little to much space between me and my companions. 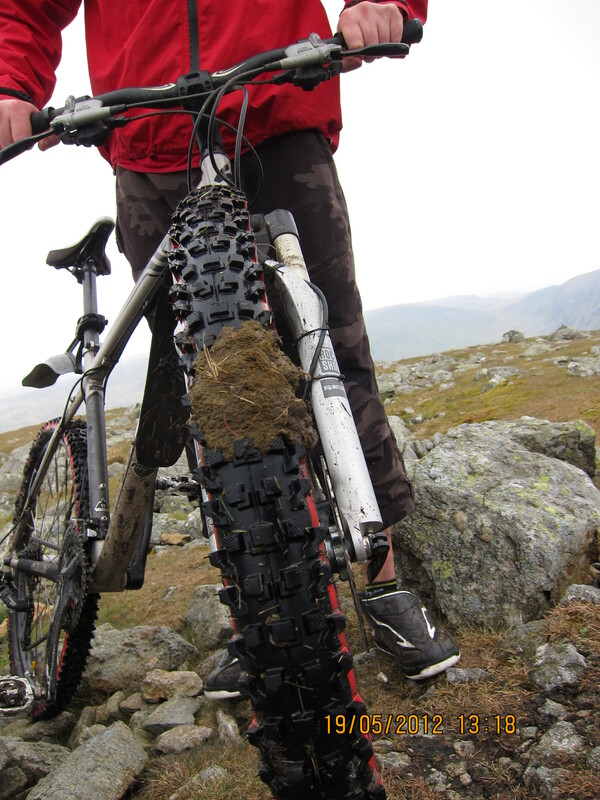 I think it comes from mountain biking alone for so many years. Just pushing myself without anyone else to consider. It’s a habit I guess and one I should be aware of when I have company. Jack pointed observed one woman who he said was wearing make up to cover the fact that she had red cheeks, blushed by the stiff climb. Funny enough but then went on to remark that another woman didn’t even bother. I don’t know which is the lesser of the two insults but it’s wise to sometimes talk loudly over Jack incase someone takes offense. 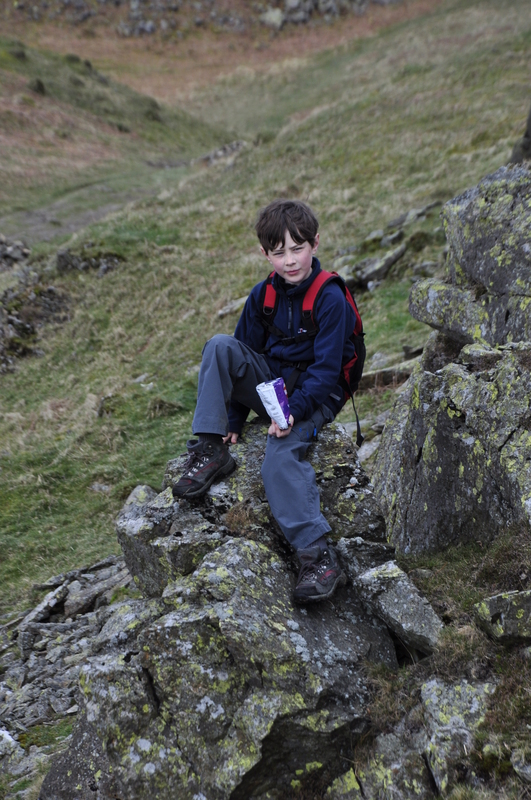 So we stopped some more and took in the fine views over towards the Coniston Fells and Langdales, as well as a KitKat, but other chocolate coated biscuits were also available most carried by Jack, a gardian of anything chocolaty though relieving him of them can end up in a fight to the death. 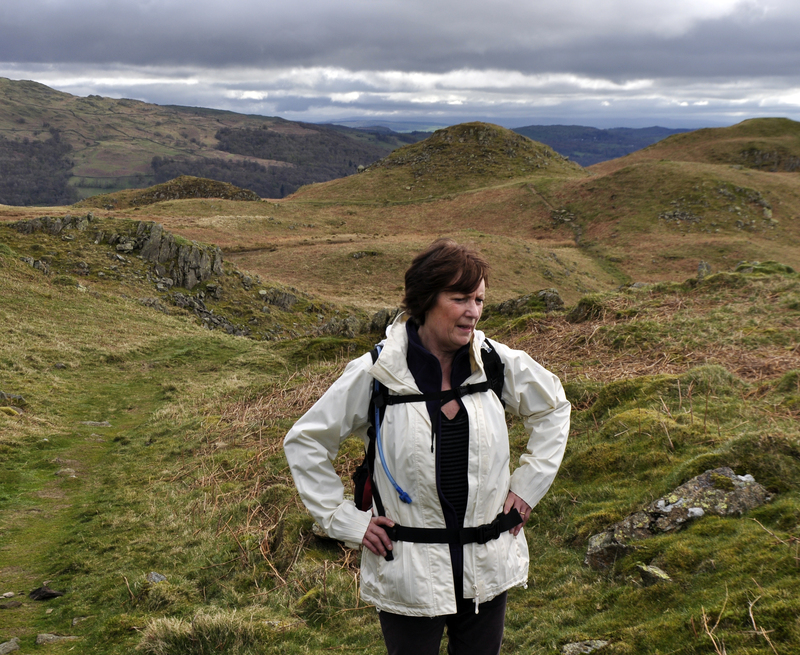 A short staircase climb onto Loughrigg summit greets you with a fine stoney plateaux, a trig point and half the worlds populations and his dog. 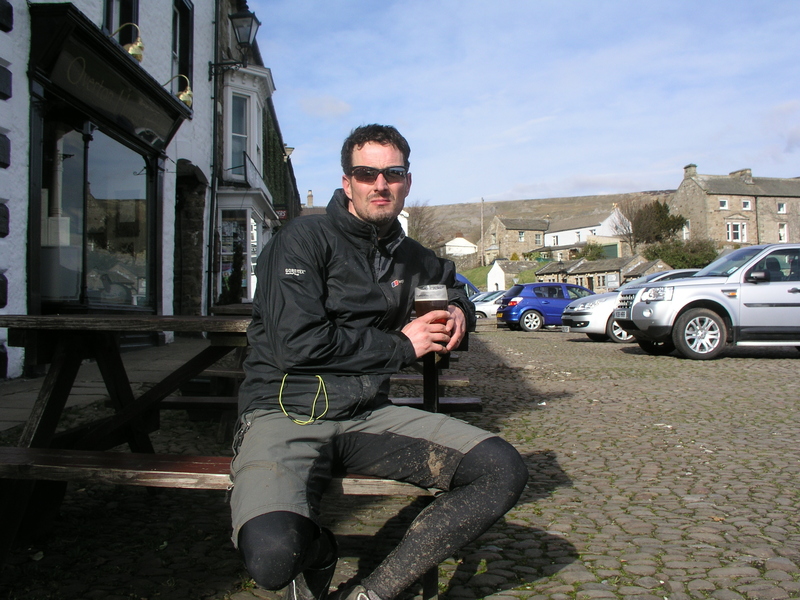 I overhear someone ask a couple of fell runners how long it took them. 15 minutes! Not bad I suppose it only took us an hour and 15 minutes and we were just walking and clarting about. 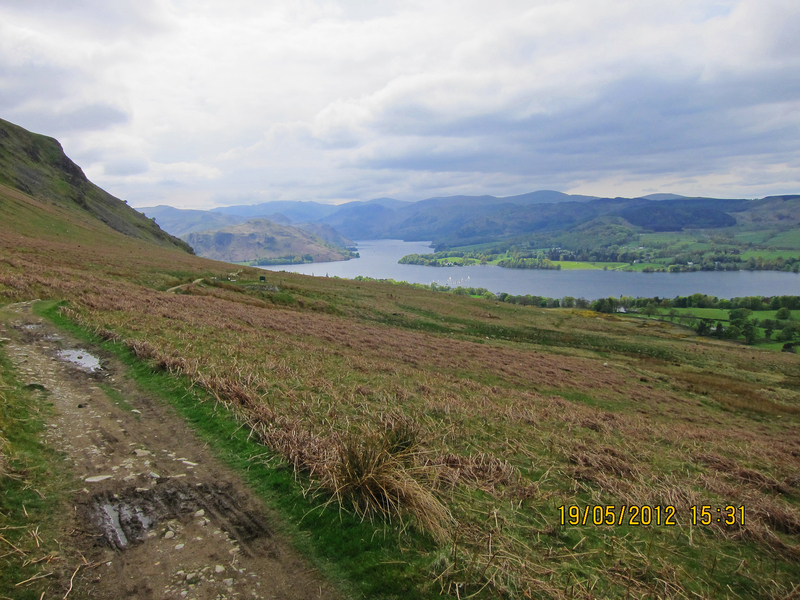 A supreme effort and one worthy of a sit down with some ham sandwiches, at first on the windy side towards Grasmere and then some more on the warmer southern side overlooking Windemere. 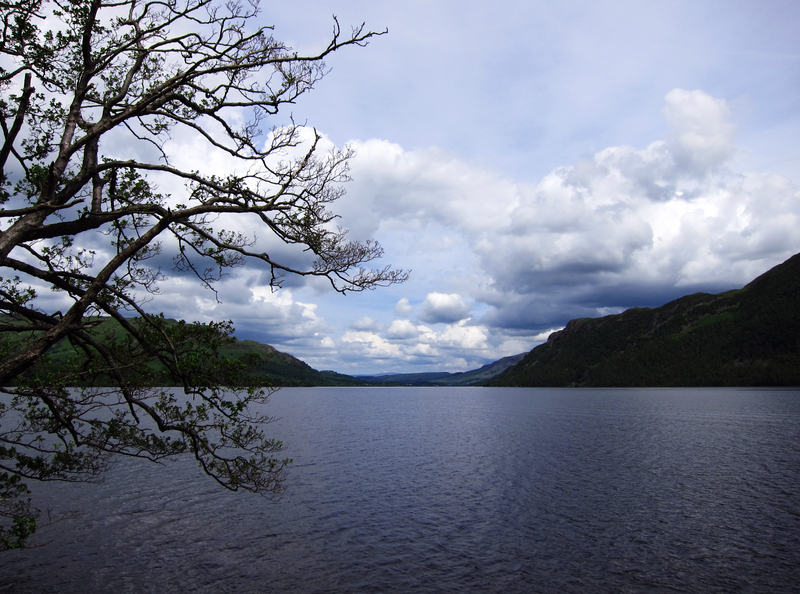 The best aspect of this walk is the constant surrounding bodies of water you see. 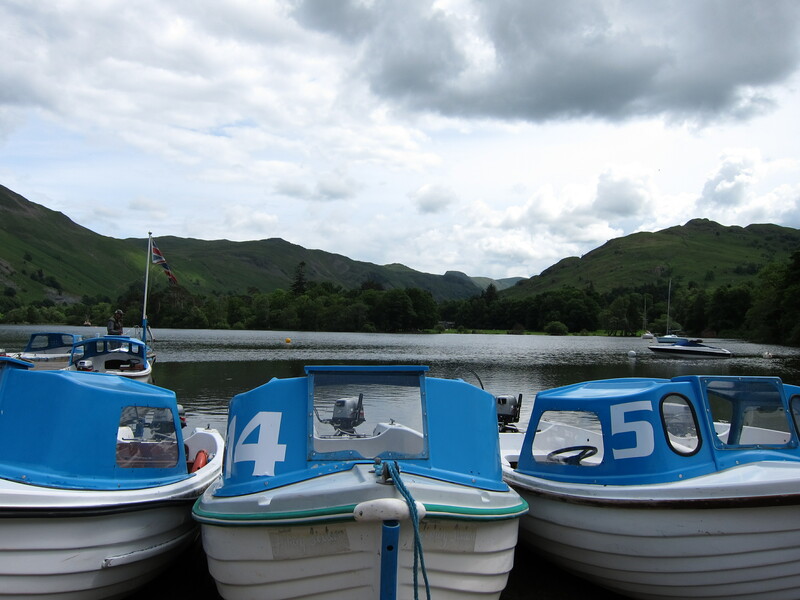 Loughrigg Tarn, Elter Water, Windemere, Rydal Water all make up that architypical lakeland walking experience. Little wonder it’s so popular so why would it not be a little crowded on a Sunday when so many are fighting crowds in busy shopping malls. 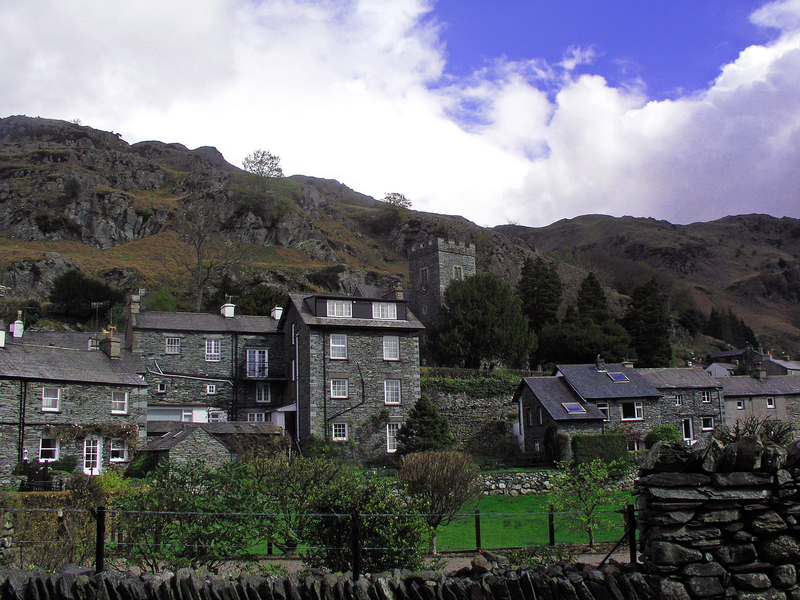 The neighbouring peaks can be seen across Rydal. 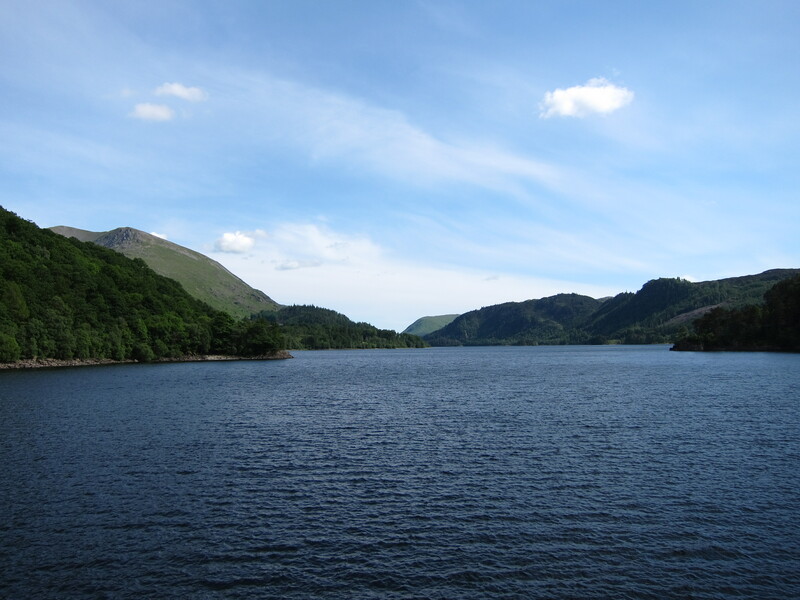 The lower ones that make up the epic Fairfield Horseshoe. 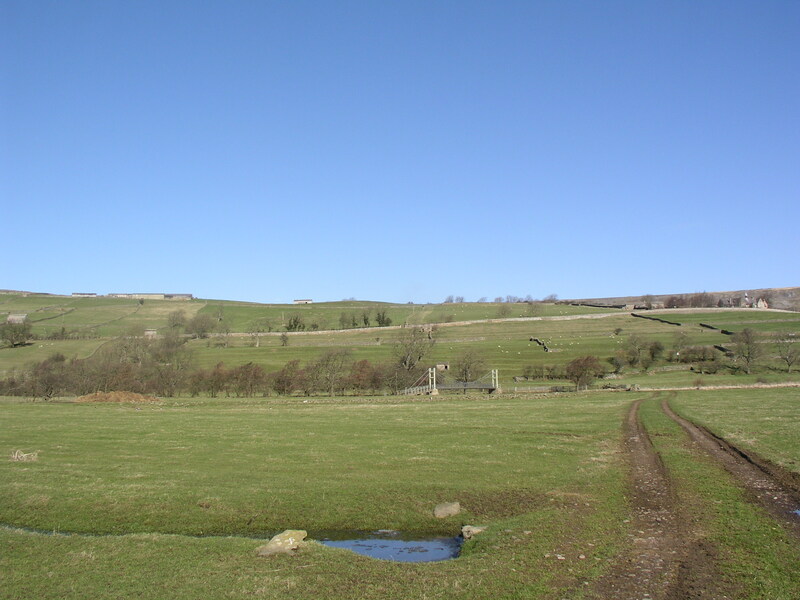 Low Pike and Nab Scar being the ends of the shoe. 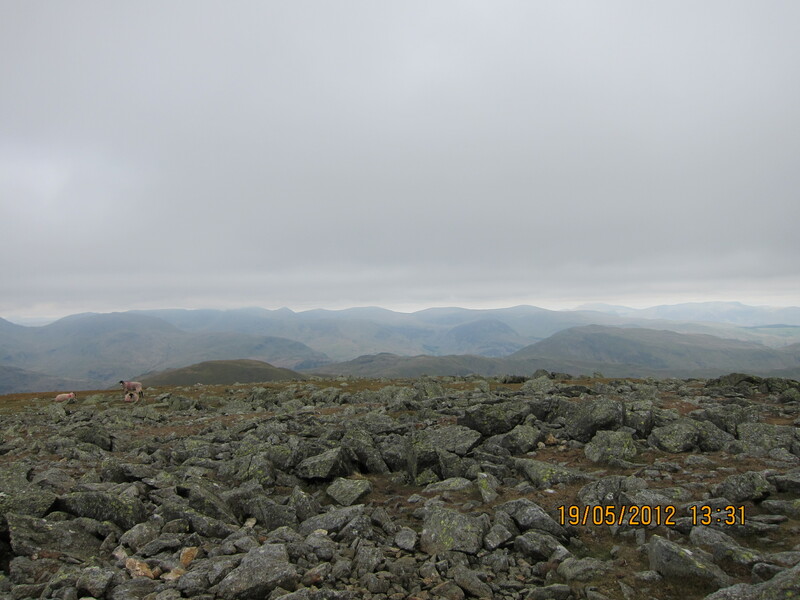 The mightier Peaks of Dove Crag, Hart Crag, Fairfield and Great Rigg are greyed out today. 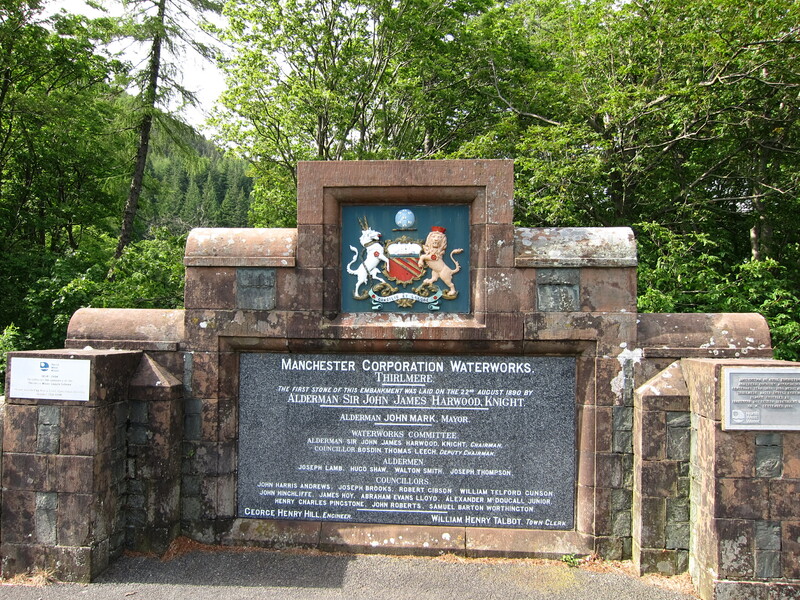 That’s a walk reserved for those made of sterner stuff and powered by more than crisps and a kitkat. Haribo maybe? Jack and Emily set off to find a geocache hidden not to far from the summit point and found it easy though again a little disappointed to not find anything of use to them inside. 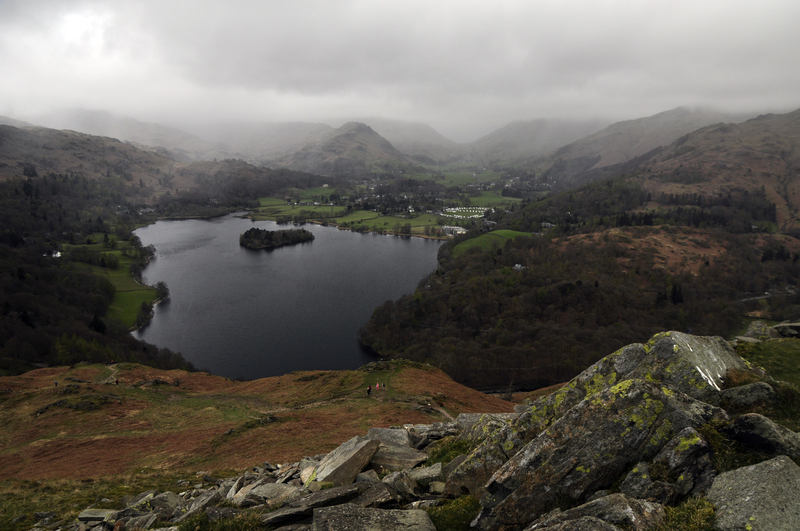 The rain was beggining to make an appearance from the Langdales darkened clouds prompted a move. 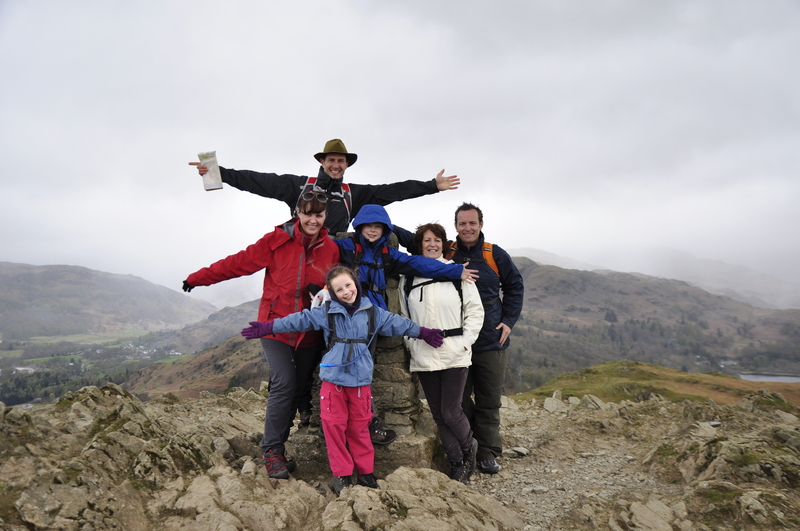 So we whipped out the jackets and took our summit photo before heading down the North Bank towards Grasmere and Loughrigg Terrace. 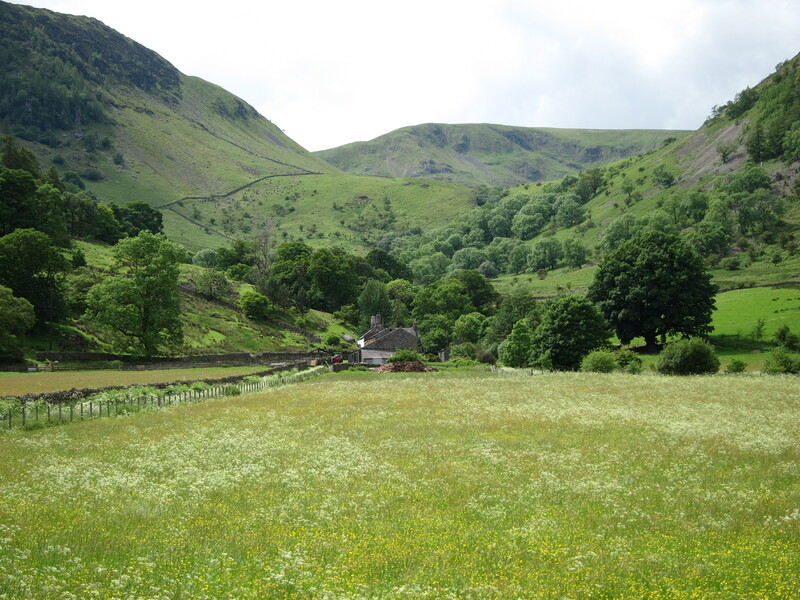 This is a fine a walk with a view that lasts. 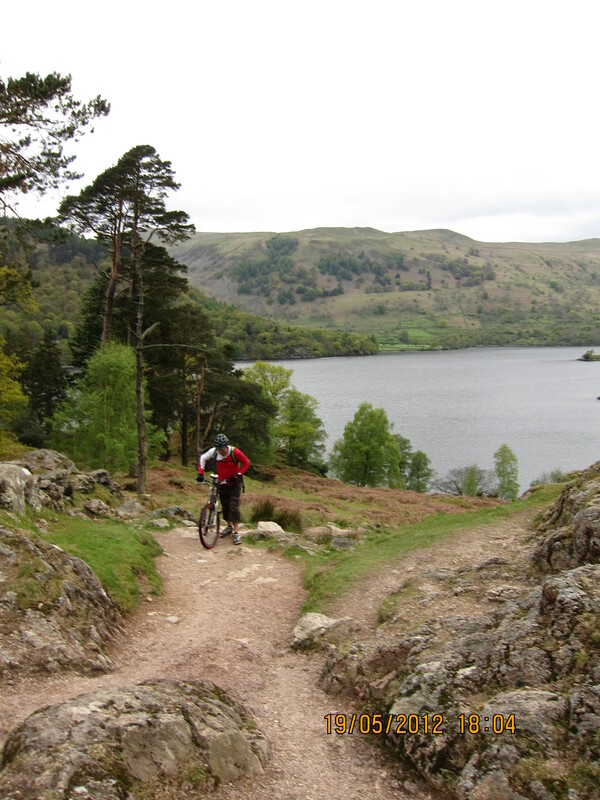 The drop to Loughrigg Terrace is another thigh trembling descent that winds down on a well built path sturdy enough to cope with the thousands of boots that tread it each year. 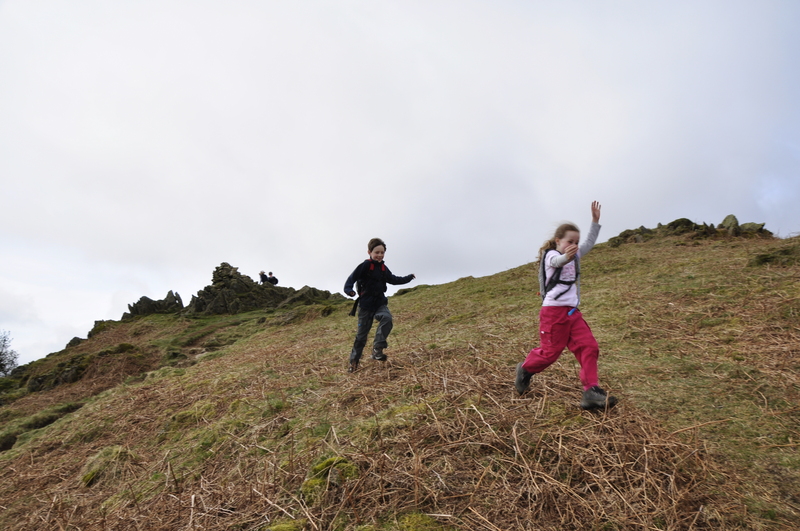 This of course is where the small people effortlessly accelerate down towards Grasmere. Lesley did her best to chase them down but they were in the zone and out of site. 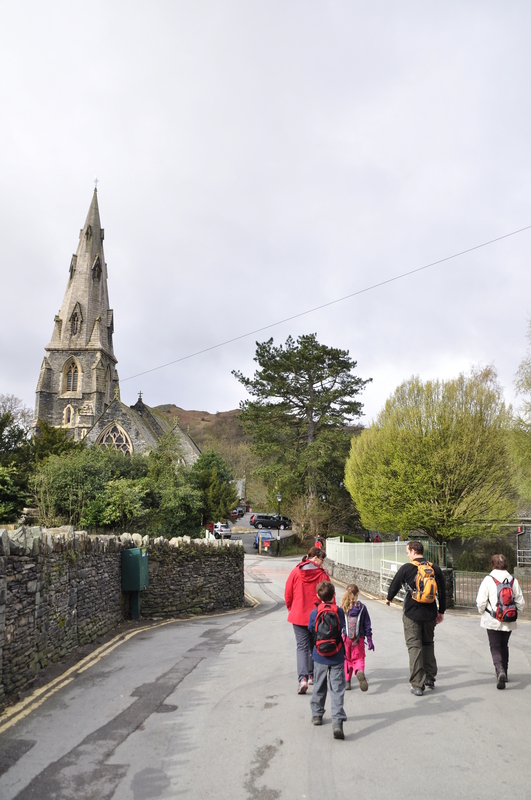 I caught them up just as they were about to descend on the wrong path to Rydal Water simply because that’s where the people infront of them were going. 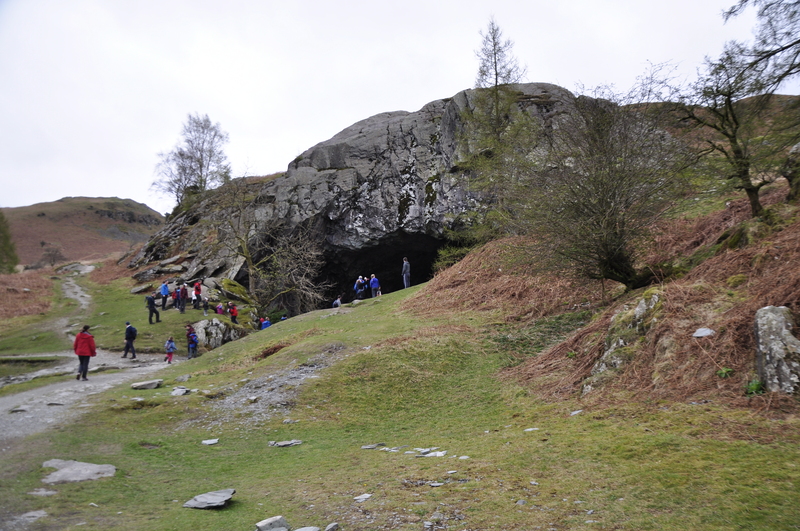 Back on track we all bunch up and took the high road contouring the fell above Rydal Water to the very impressive Loughrigg Cave, not a natural cave it is actually created from an old slate quarry blast, but is extremely impressive and even has its own small lake inside and a duck! nearest tea shop, the Chocolate Bar on Millans Park for some fine tea and hot chocolate on a big sofa. A cracking walk and for me I’ll be back for a C.R.A.S.H. tour of this fell though maybe I’ll savour this one for a weekday when it’s a little more bike friendly. 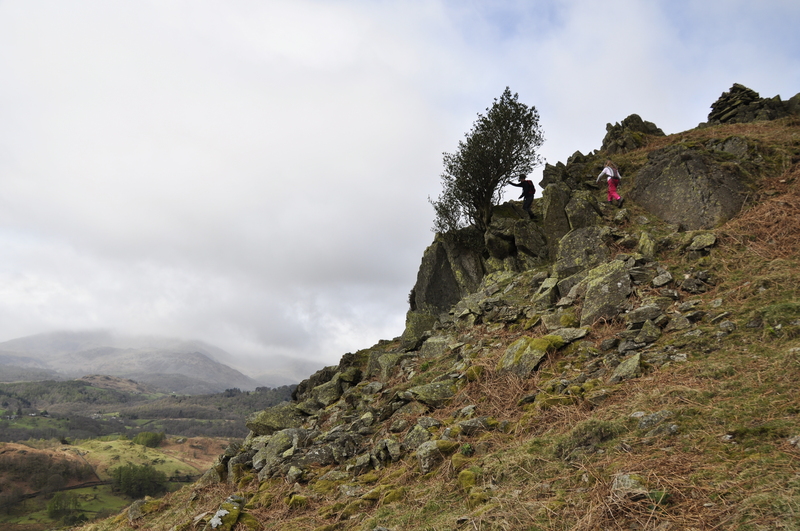 Fancy a scramble up Halls Fell Ridge onto Saddleback in May?